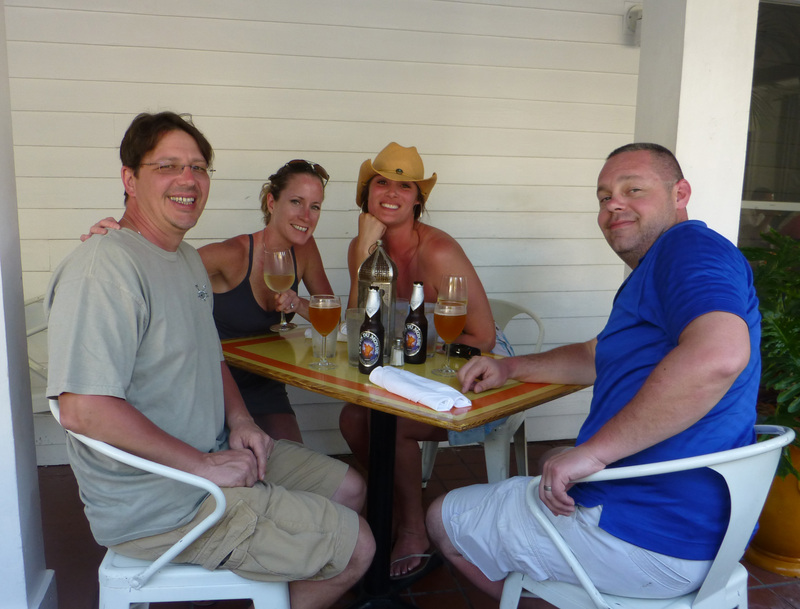 This was our 8th time going to Key West and we were very eager to return after a long and cold winter season in NJ. Despite getting between 6-7 inches of snow the night before, we were able to get to Newark airport without any delays. 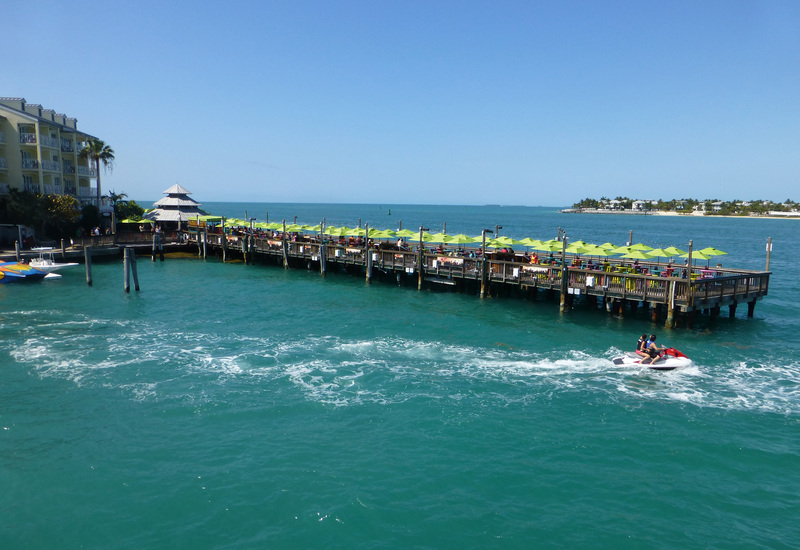 Our flights were on time and not before long, we arrived in Key West a little after 1 o’clock in the afternoon. The weather was a little bit disappointing with overcast skies with some showers, but we figured at least we made it! After grabbing our checked luggage, we went outside to find a taxi. Being it was mid March, there were quite a bit of people waiting for taxis. We had to wait about 20 long minutes or so for a pink taxi that pulled up and took us “home” to the Garden’s Hotel http://www.gardenshotel.com. 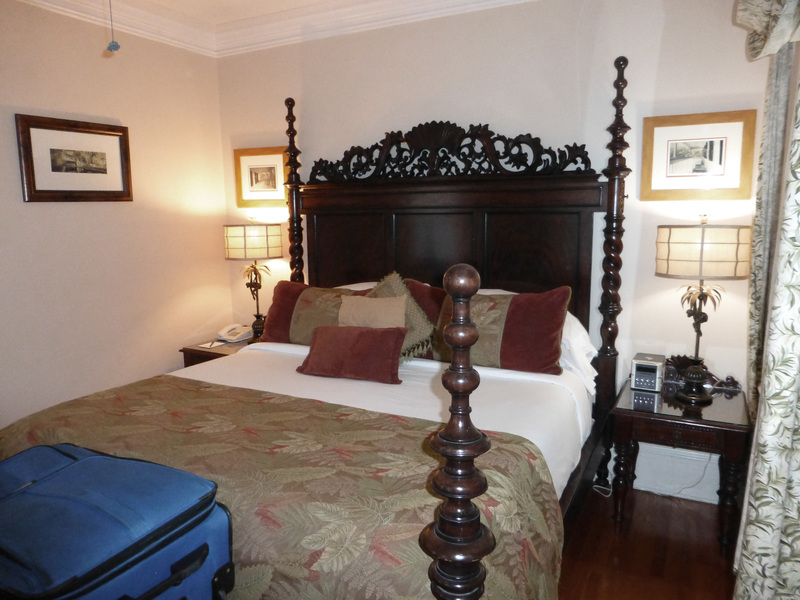 Upon check-in, Nancy poured us two glasses of chilled prosecco. She gave us the run down of what things were new since our last visit the previous year. 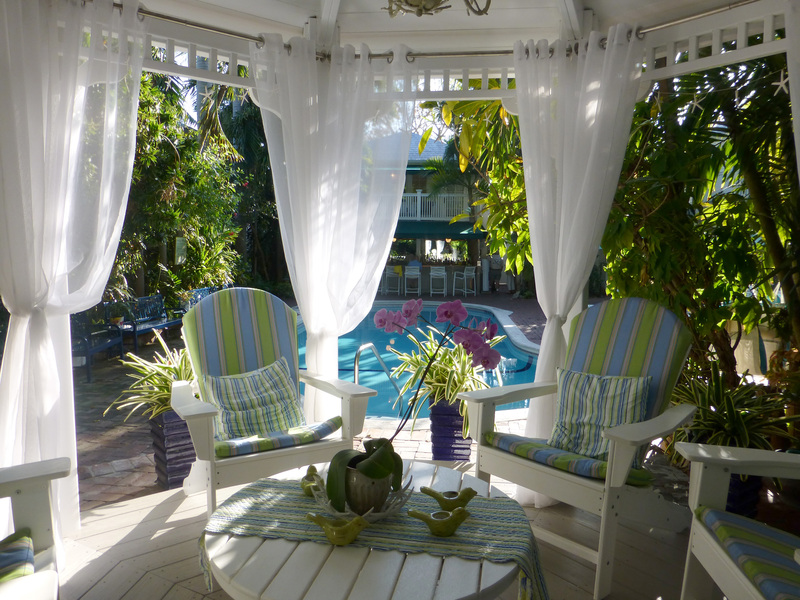 We noticed that they now have a beautiful gazebo pool side where the jacuzzi used to be. Our room wasn’t ready so we decided to sit at the Garden’s bar near the pool to relax for a bit. As we were waiting Nancy came outside to give us two more glasses of prosecco which made the waiting seem not so long. 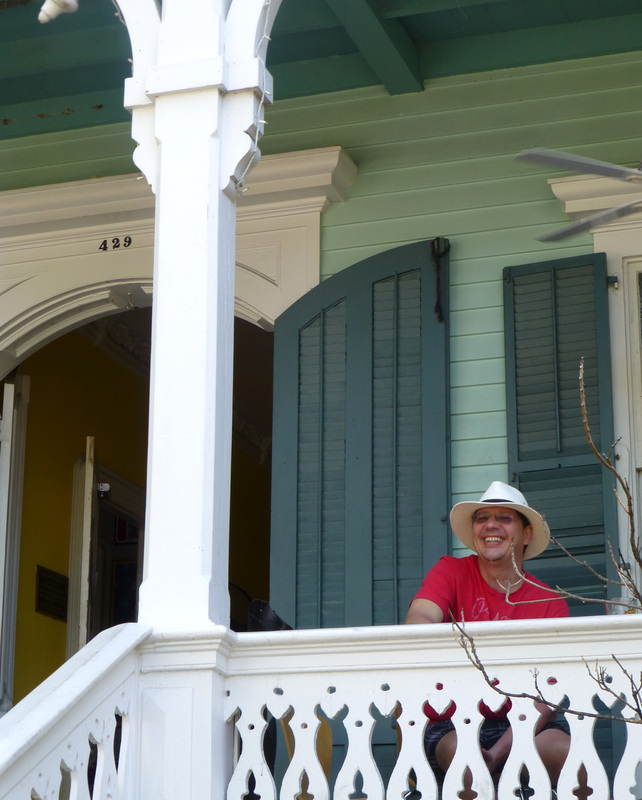 Once our room was ready, we quickly changed into something more comfortable to begin our walk down Duval Street. 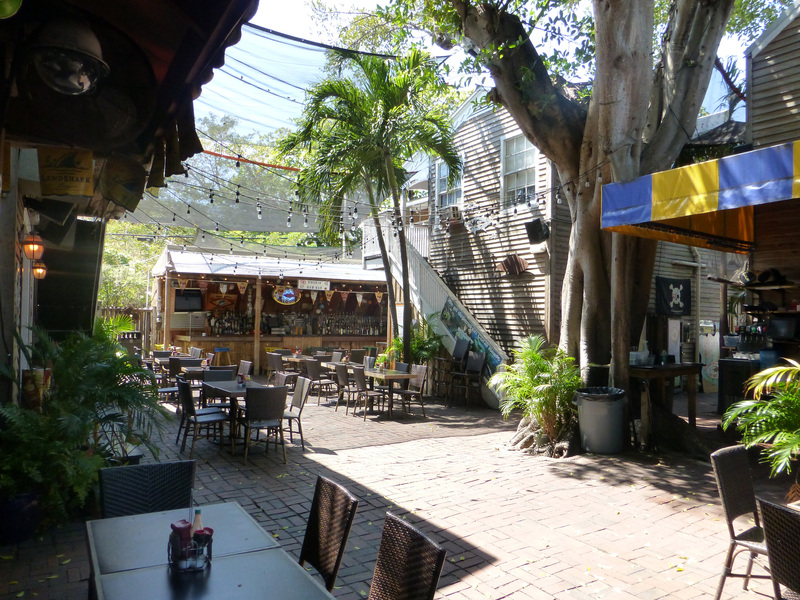 Our ritual is to make our first stop Willie T’s for one of their two for one margaritas http://www.williets.com. We quickly drank them down while listening to some entertainment. 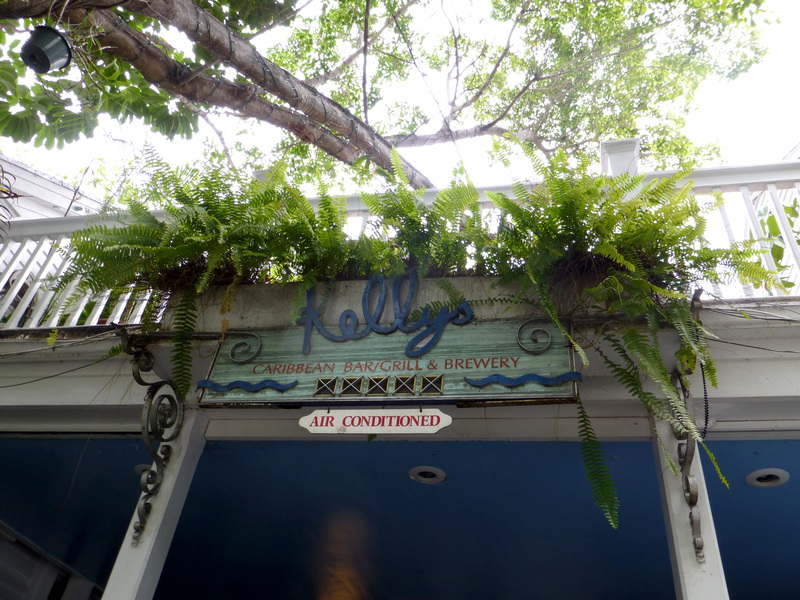 The place was very crowded so we headed out and made our way down to Caroline St. and to Kelly’s http://www.kellyskeywest.com. 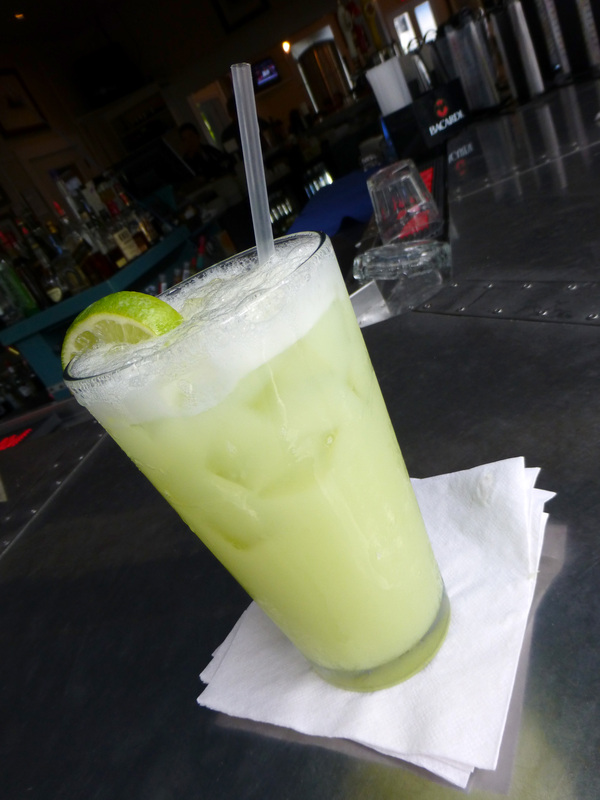 After the margarita from Willie T’s, I was in the mood for the key Lime margarita. It wasn’t happy hour yet, so we were able to grab a seat near the bar. 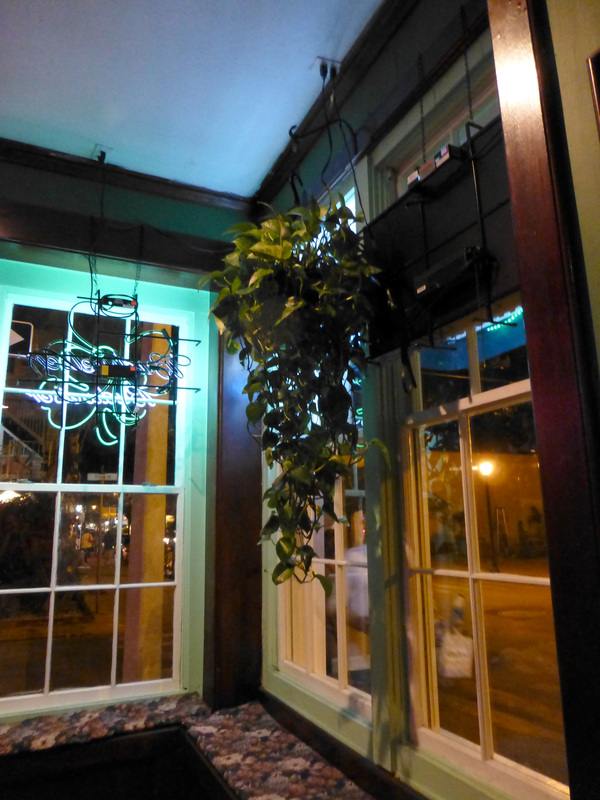 Kelly’s margaritas never disappoint and the lush surroundings is so appealing. 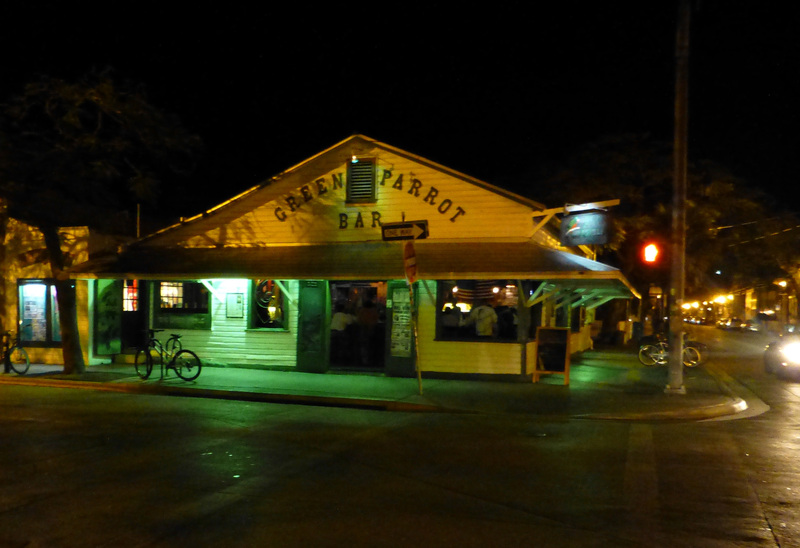 We originally headed down to Key West back in 2006 to visit friends of ours who come down for half the year from NY (a.k.a. Willy Hoppey his wife Lynda). Once we went we were hooked and have been going down to see them every year. 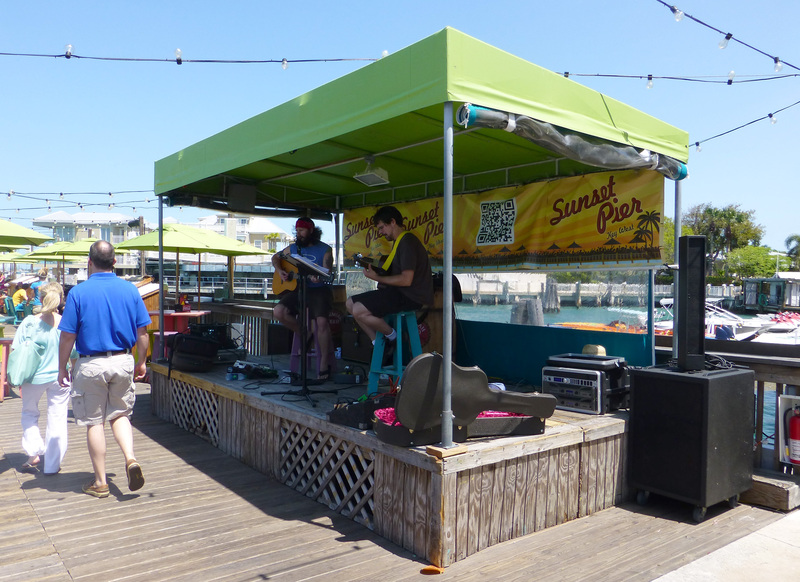 I knew that our friend Will was playing at the White Tarpon that afternoon until 4pm so we headed out towards the White Tarpon to catch his final set http://whitetarpon.com/. When we arrived he was finishing up, but we were able to hear his rendition of Jimmy Buffett’s “Tin Cup Chalice” that he just learned not too long ago. Soon it was getting to be that time to return back to the Gardens and freshen up. I knew that Billy the bartender would be working by the time we got back and wanted to touch base with him regarding our up and coming fishing trip that was scheduled for that Thursday. 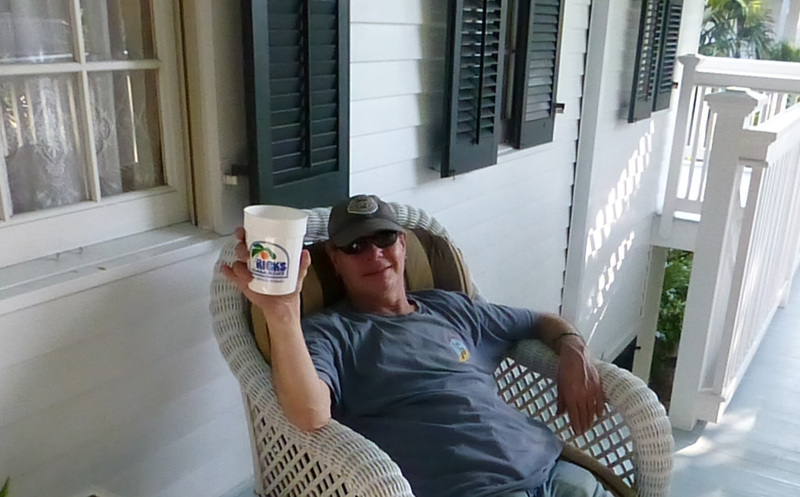 We got back to the Gardens and had a few drinks poured by Billy. Since he wasn’t able to take a couple of people out on the water because of the weather, we decided to change our fishing trip to Friday, which was fine by us. 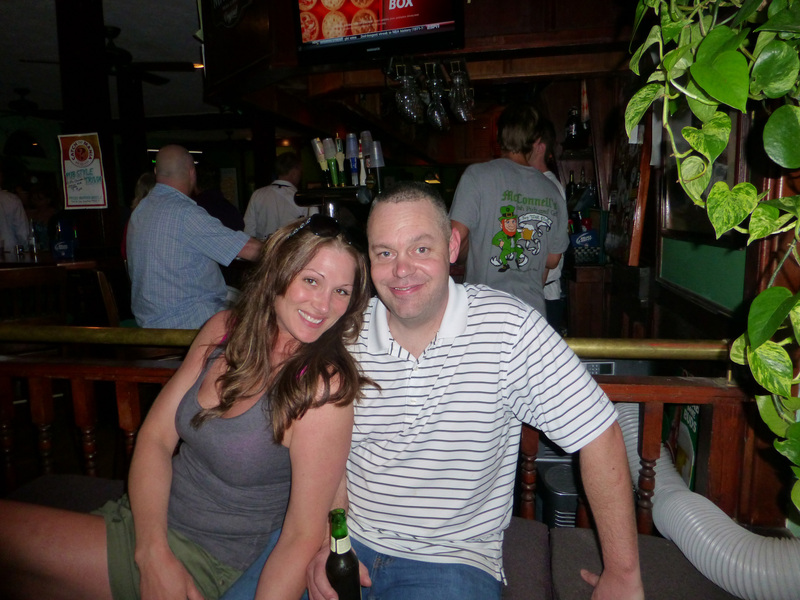 We freshened up and had one last beer at the bar. We were beginning to get hungry after the long travel day and we noticed that the Gardens now offers a few food items at the bar. We ordered the hummus dip and the pizza to tide us over. 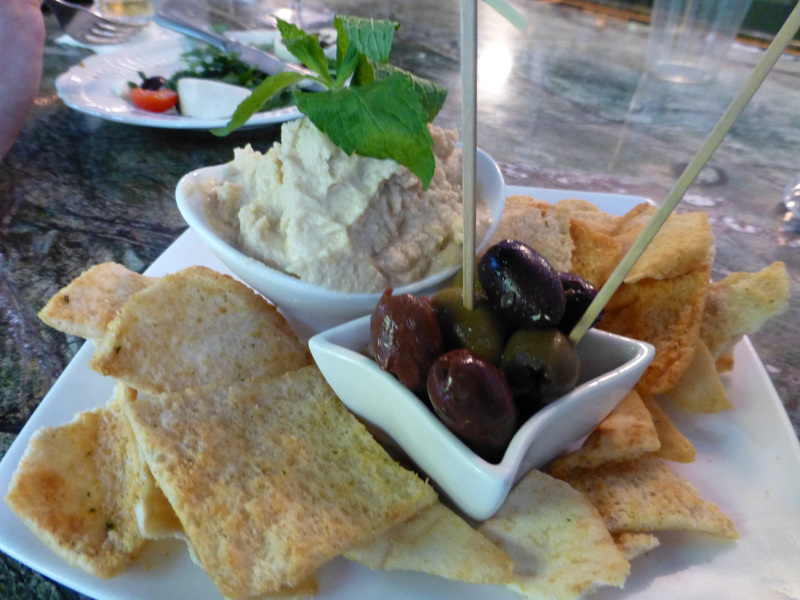 Unfortunately the pizza wasn’t available at the time so we settled on the hummus and a few other snacks. 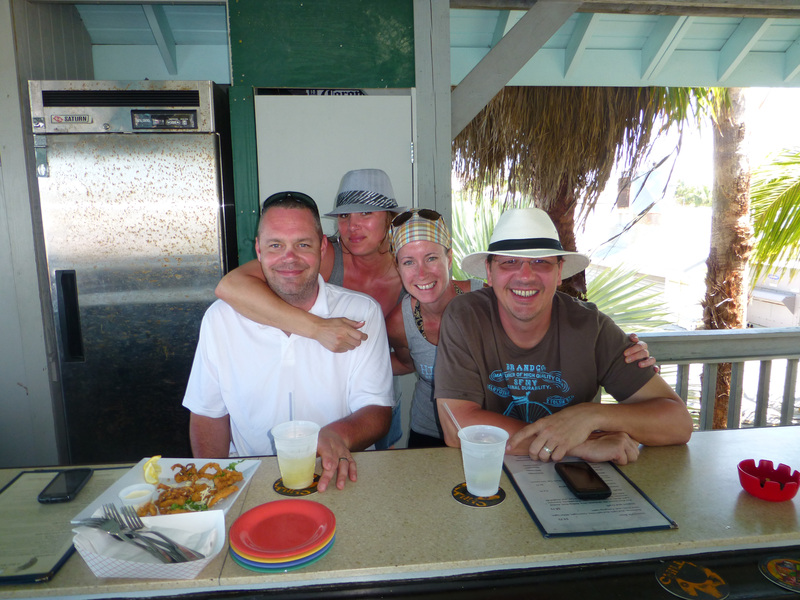 Last year when we came down to Key West, we met up from fellow friends of Will and Lynda, Chip and Johnnie. They were scheduled to arrive in Key West a bit earlier that day, but ran into an issue with their flight. They had to make an emergency landing in NC due to a passenger’s medical condition. Luckily they made it to Miami, however they had to rent a car to Key West, because they missed their connection to Key West. We finally got in touch with them and they made it town to Key West around 5pm. 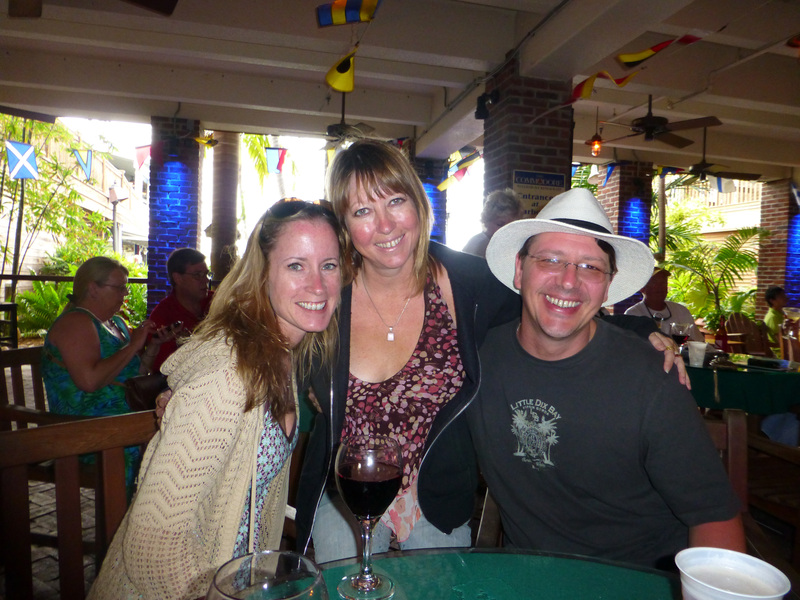 We agreed that we would all meet up at the Galleon’s Tiki Bar since Will was already playing there, and we were going to meet up with his wife Lynda as well. The skies were beginning to clear and I knew it was a positive sign that no more overcast skies for our trip. Once we made it to the Galleon, everyone was already there. Unfortunately we just missed the sunset, but it was great to see everyone again and enjoy a fun evening of good friends and music. After a long travel day, everyone was getting tired. Once Will finished his set, we said our good byes and headed back towards the Gardens Hotel. Chip and Johnnie accompanied us back since they were staying at the Chelsea House, located a few blocks behind the Gardens. We made it back to Angela St., but then decided to have a night cap at 915. 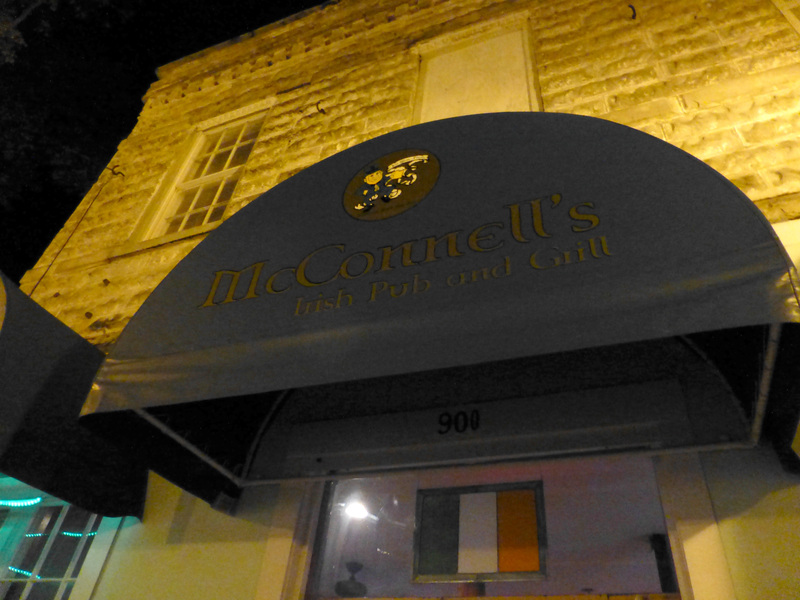 As we headed down towards 915, we noticed a cute Irish pub called McConnell’s. So we changed our minds and had a beer at McConnell’s. Everyone was tired but also hungry. Once a few wings were ordered, I realized how tired I really was. Our flight out of Newark was at 6:30 that morning and I was up since 3:45am. Needless to say I was done. It wasn’t too far of a walk back to the Gardens, so I wound up headed back to the hotel on my own. I made it back but had some trouble opening the 2nd gate to the gardens with my key. I told the staff the following day and they said that the 2nd gate should have been opened for guests during the evening and not locked. Luckily for the rest of our stay it was open and didn’t run into that problem again. We decided to meet back up with Chip and Johnnie the next morning for breakfast at Blue Heaven. 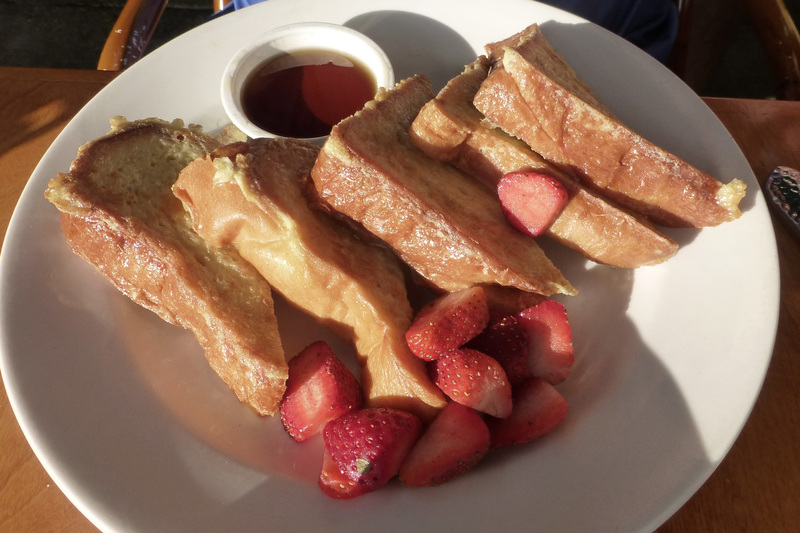 Everyone had a great breakfast while enjoying the sunshine and warmer temperatures. With our stomachs full, we went our separate ways to do some shopping and would meet up later on at some point. My husband and I debated about relaxing by the pool at the Gardens for a while, but it was still too cool out. 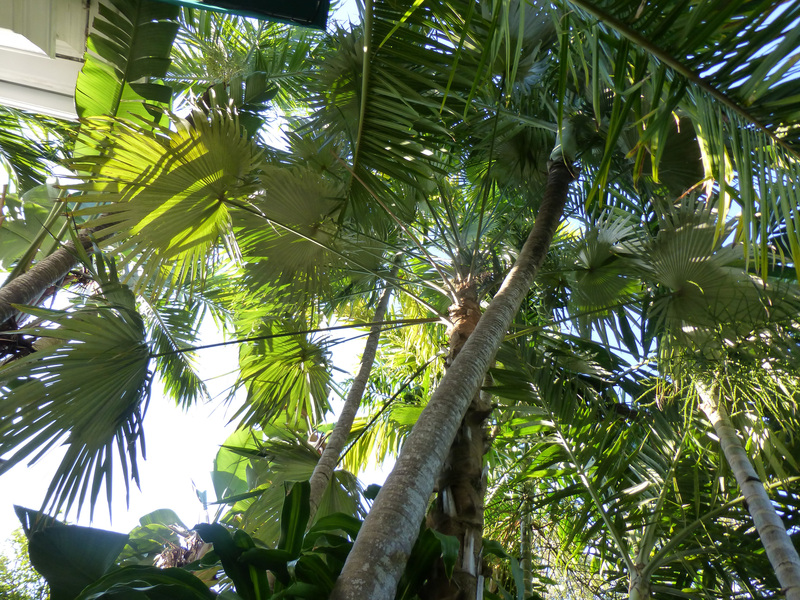 Plus the vegetation had a the majority of the pool area covered with shade. Instead we opted to head back out onto Duval and make our way up to the Bight. I read that Jimmy Buffett was in town the month before working on his “Songs from St. Somewhere” album. I never realized that the white box of a building near the start of the historic walk was his recording studio. I guess its unassuming on purpose so you don’t recognize it. After taking a picture of the recording studio we walked around a couple of the shops. 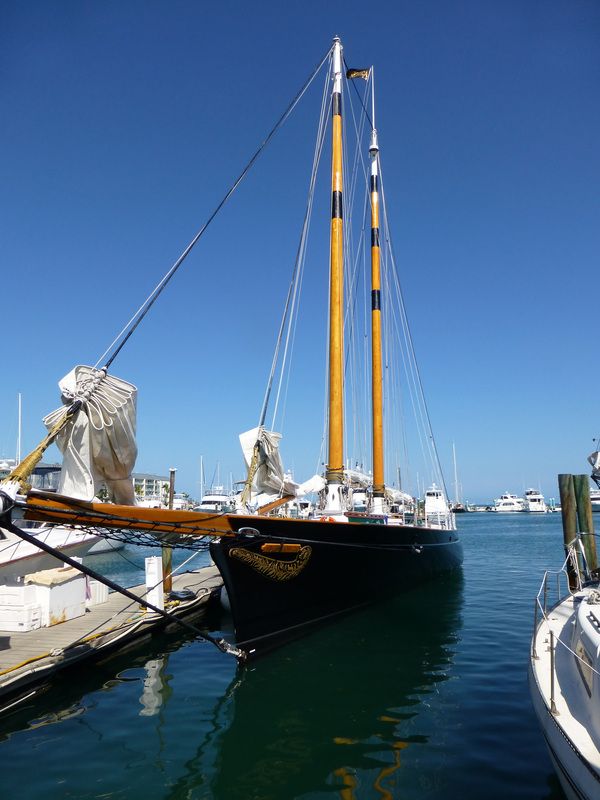 We didn’t find anything worth purchasing ,so we walked passed the Schooner Wharf and noticed this new beautiful looking schooner called the Schooner American 2.0. I knew I wanted to go out at some point on that boat during our stay. I took down the info for later on. They were just opening up so we had the majority of the place to ourselves. 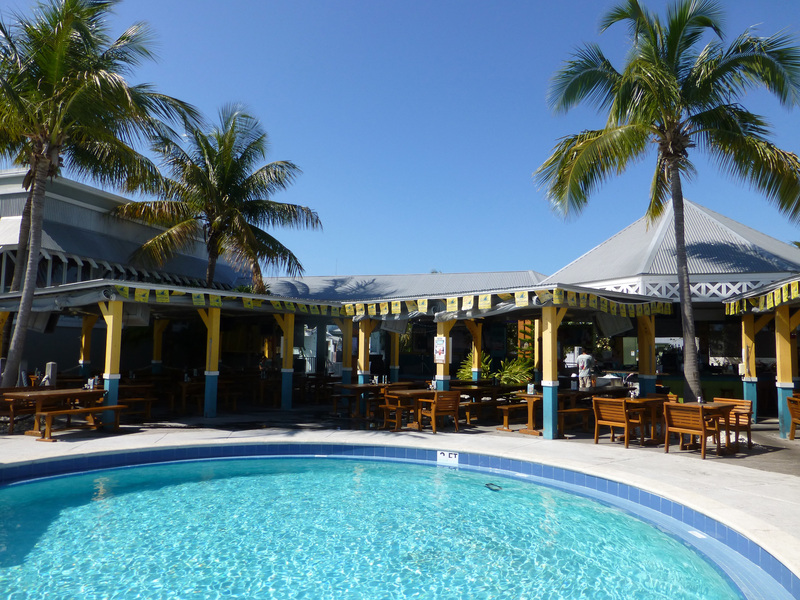 It was nice to grab a few cruzan rum drinks and sit by the pool. The sun was beginning to feel stronger so we finished our drinks and headed out back towards the Sunset Pier to meet up with Chip and Johnnie. 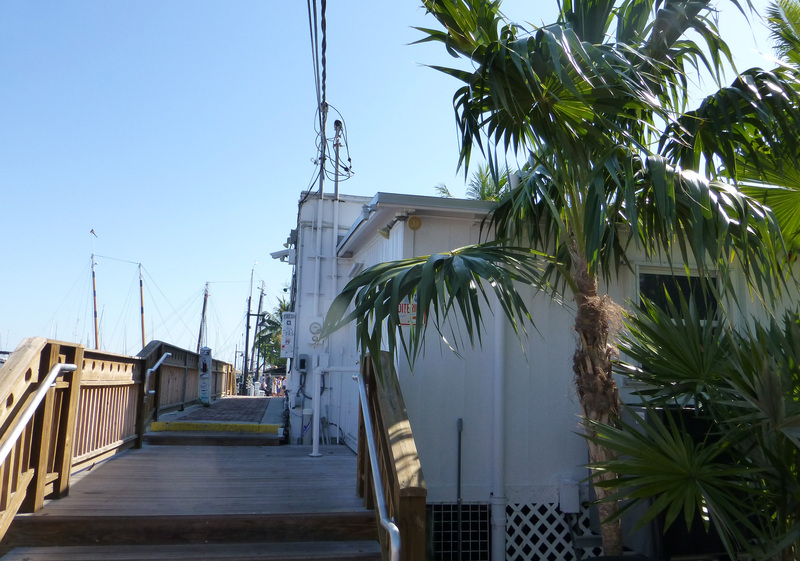 On our way to the Sunset Pier, we walked by the Pier House. 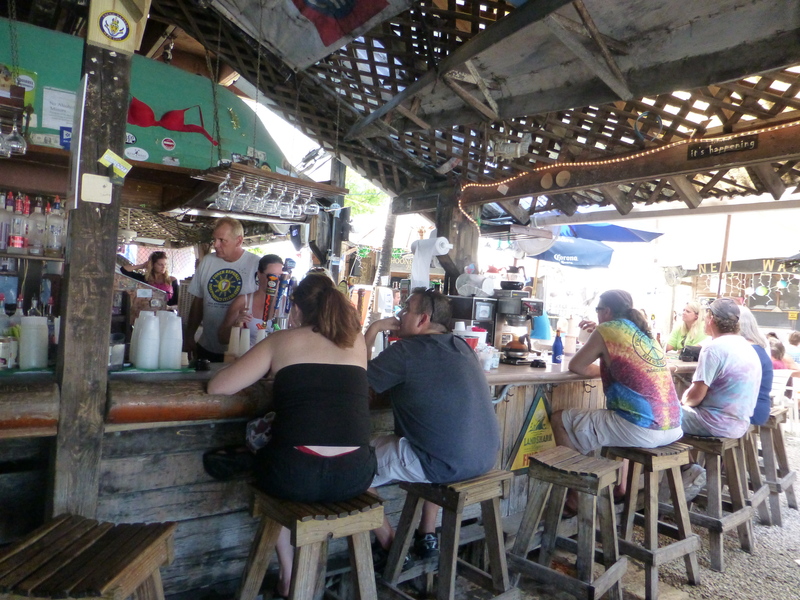 I have read reviews of their beach bar and was curious to see what it looked like, including their small beach area. We followed the signs through the property to the beach bar. 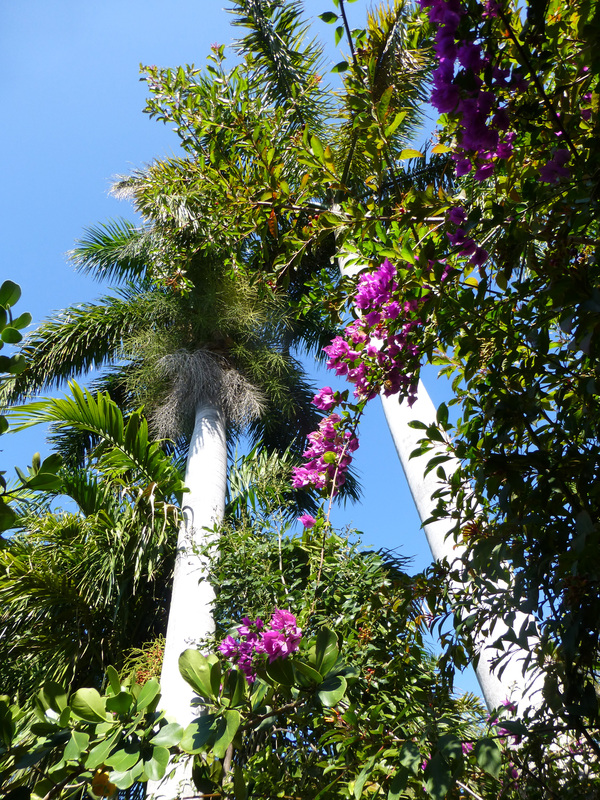 The grounds were very pretty with lush plants and flowers. 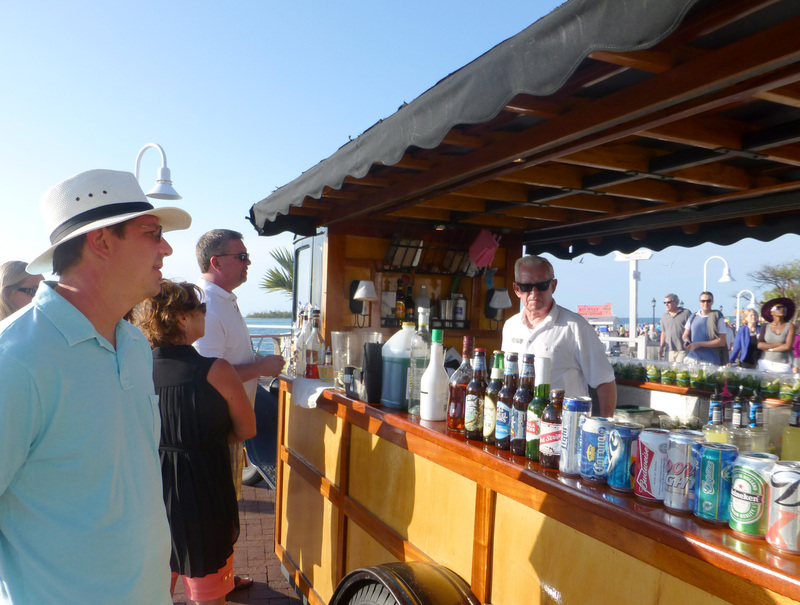 We made it to the beach bar, but were not too impressed. It was a nice area but to us, felt more or less like a typical hotel bar you could find anywhere. We walked around and saw the small beach area which was very crowded. 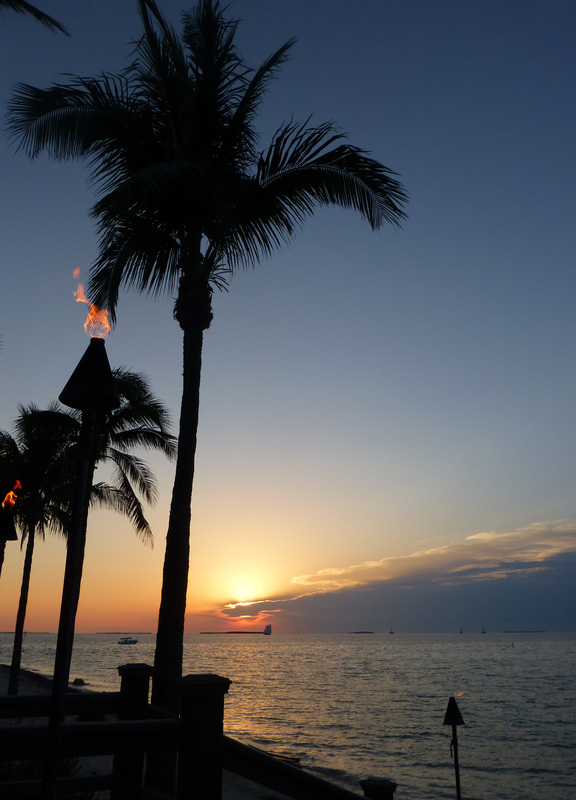 We wound up walking around the hotel to the other side where we could see the Ocean Club Resort’s Sunset Pier. Once we grabbed a few chairs our friends soon met up with us. After a few rounds of mojitos and sweet teas, we left and walked back towards the Gardens. Our friends wanted to grab something to eat so we told them we would maybe meet up after dinner since I had reservations for my husband and I at Latitude’s. (I always wanted to have dinner at Latitude’s but never made reservations. This year I wasn’t going to pass up the opportunity again so I went online and booked a table.) I called the Westin and asked when we would should pick up the boat that would be taking us over to Sunset Key. I made the reservation through Open Table for 6:45, but not realizing the time was for the boat, not the dinner. So we had to be by the pier around 6:30 to head over. It was getting later in the afternoon and we had to get back to the Gardens to get ready for dinner. Once we freshened up, we stopped by to see Billy at the bar and had a quick beer and told him we would see him on Friday. Then we headed back onto Duval to make our way back down towards the Westin. The evening was shaping up to be perfect as far as the weather and sunset conditions. 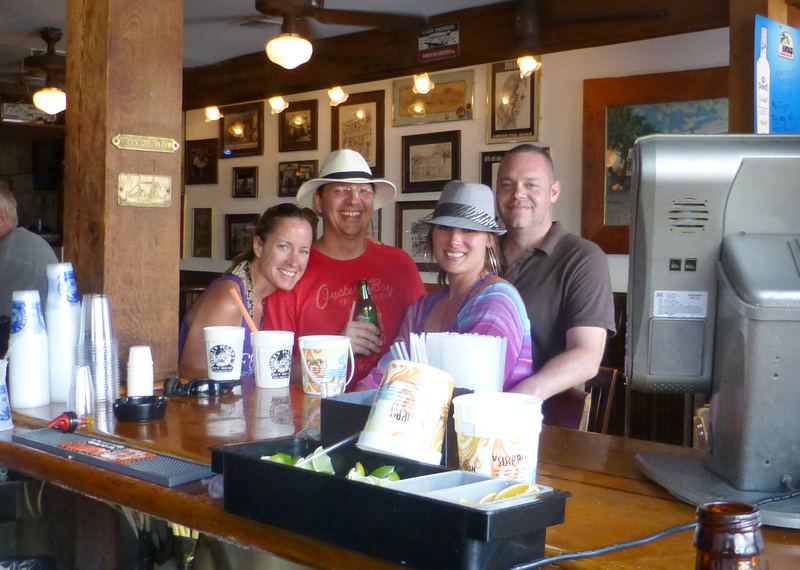 Before getting on the boat to Sunset Key, we stopped by to see Jimmy (a.k.a. Mr. Mojito) and ordered up two mojitos. They were delicious. (When we normally see Jimmy at the Westin, we have one of his signature “green things”, but this time we thought we would see if his mojitos lived up to his reputation and they did not disappoint.) With our drinks in tow, we walked down the pier to catch our boat. We saw a line of people waiting, so we knew we were in the right spot. Unfortunately we were told that we could not bring our drinks on board with us. My husband managed to finish his drink in time, but I had to throw mine away. Once we arrived it felt like we were on our own little island in the Caribbean. We walked down the pier to the restaurant. 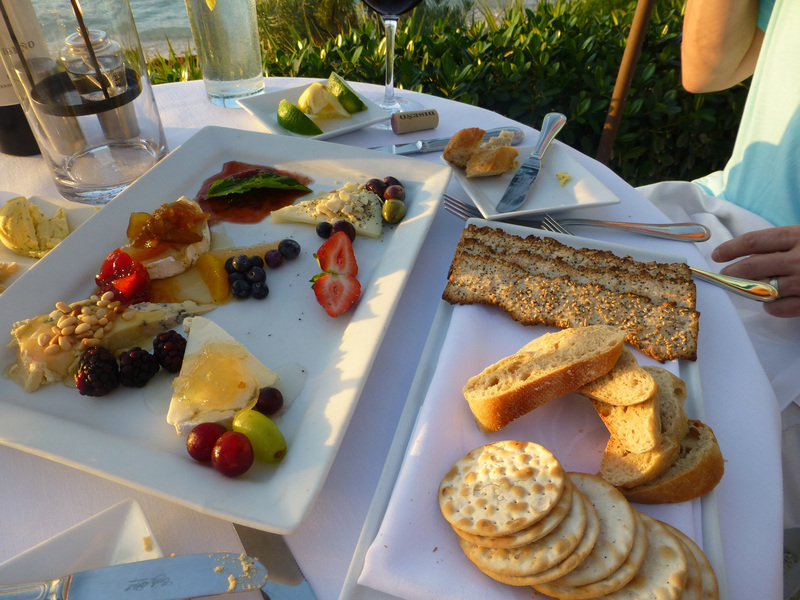 I requested a table for two, near the water and/or on the beach. We walked up to the hostess and I gave her our name. She sat us at a table for two right on the beach. I was so happy! It was perfect. It was a beautiful sunset nevertheless. 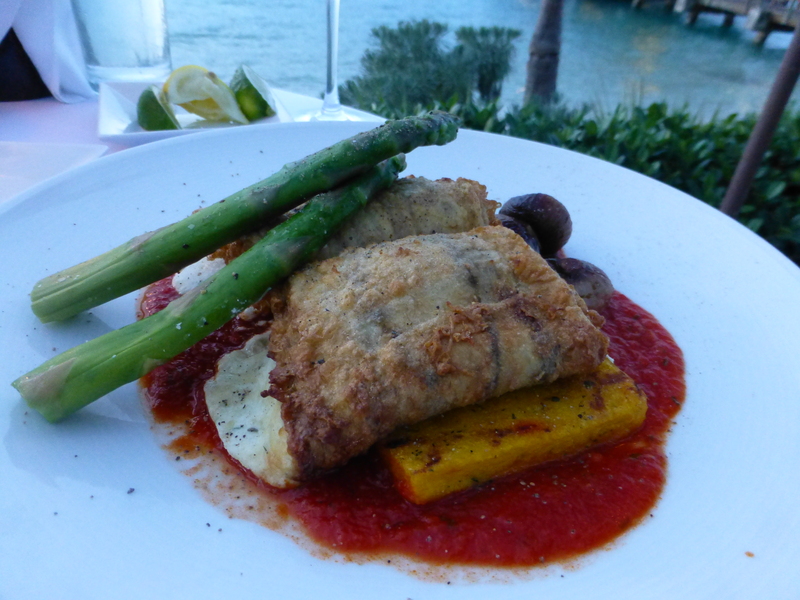 For dinner, my husband wasn’t too hungry (since he had a bite to eat at Smokin’ Tuna), he ordered the eggplant and I had the yellowtail snapper special. 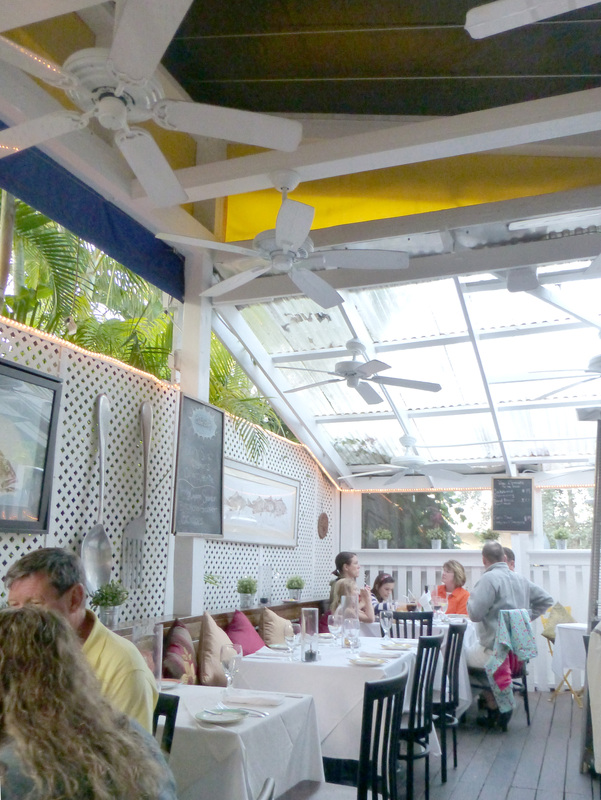 The food, the service, and of course the ambience was terrific. I would definitely make it a point to do again if we have the opportunity. After dinner we went back to the boat where they took us back to the Westin. We were going to give our friends a call, but we were quite tired. Plus we were supposed to meet up with them for breakfast at the Banana Café the following morning. 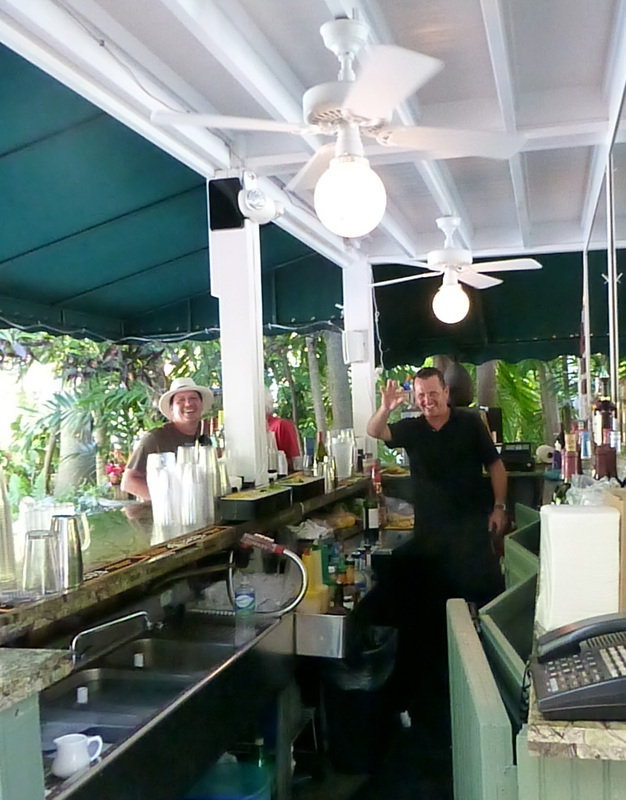 We walked back to the Gardens Hotel and there were Johnnie and Chip at the Garden’s Bar! So we enjoyed a couple glasses of wine before heading back to the room. It was a good walk but it was easy to find. 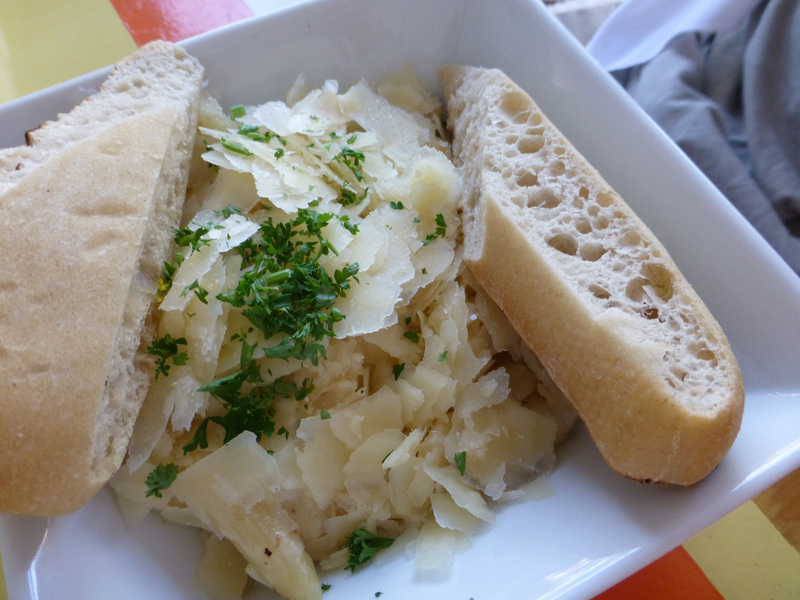 The café was very cute and accommodating with a diverse menu specializing in french fare. 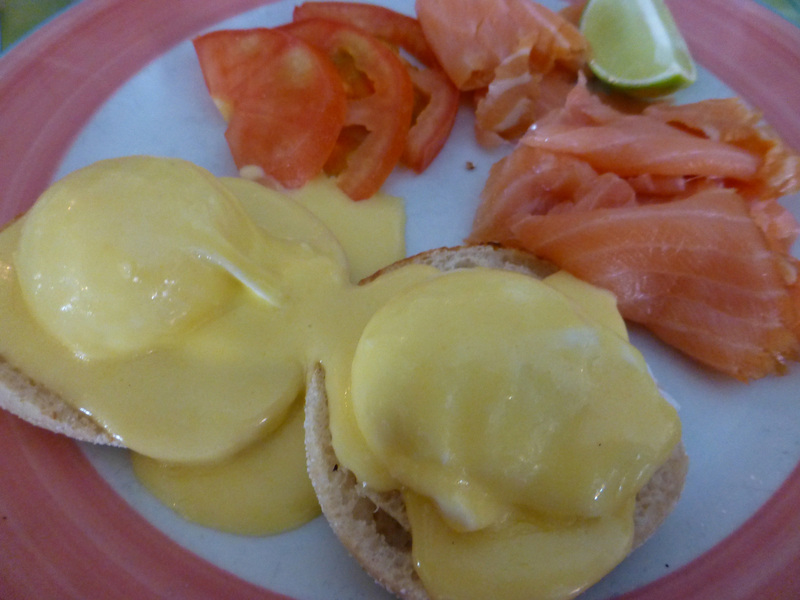 My husband tried one of their signature crepes, while I chose the smoked salmon eggs benedict. Since it was still a bit breezy in the morning we wound up eating inside instead of outside. We did hear a few people say they were cold, so we were glad we were inside. We discussed about what to do for the day since the next day we were scheduled to go fishing with Billy. 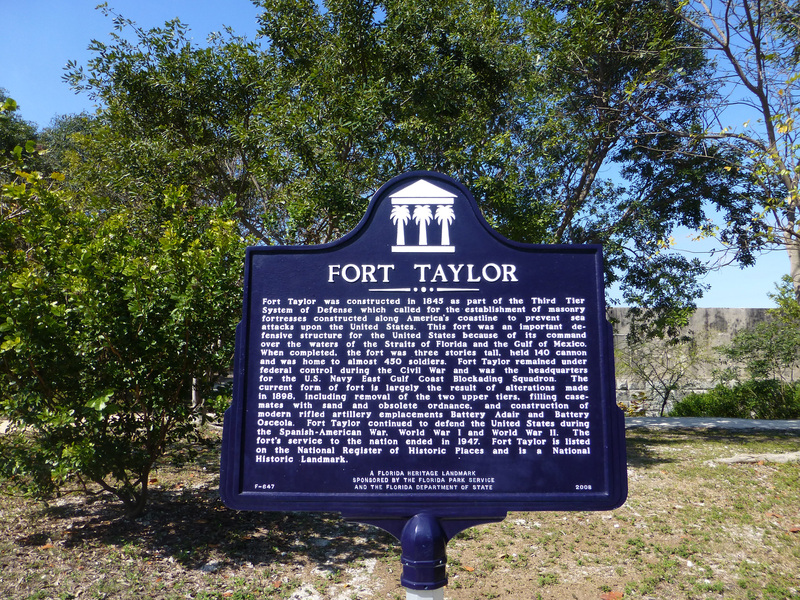 Johnnie and Chip wanted to go to the beach for the day and I wanted to see Fort Zachary Taylor State Park. 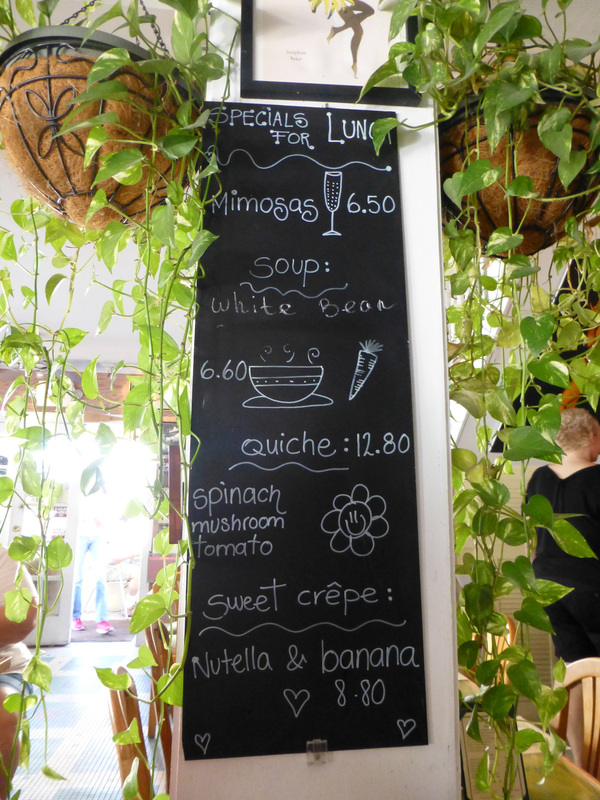 After a very good breakfast, we wanted to stop at a sandal place we passed on the way to the Banana Café. As we were walking down Duval, all of a sudden we see 5 planes fly over us very closely. We realized it was the Blue Angels, and they were flying over Key West because of the air show that was happening on the weekend. It took us by surprise, but it was amazing to see them like that. I was bummed that I didn’t have my camera ready for the picture. After our fly over, we went our separate ways to do some more shopping. 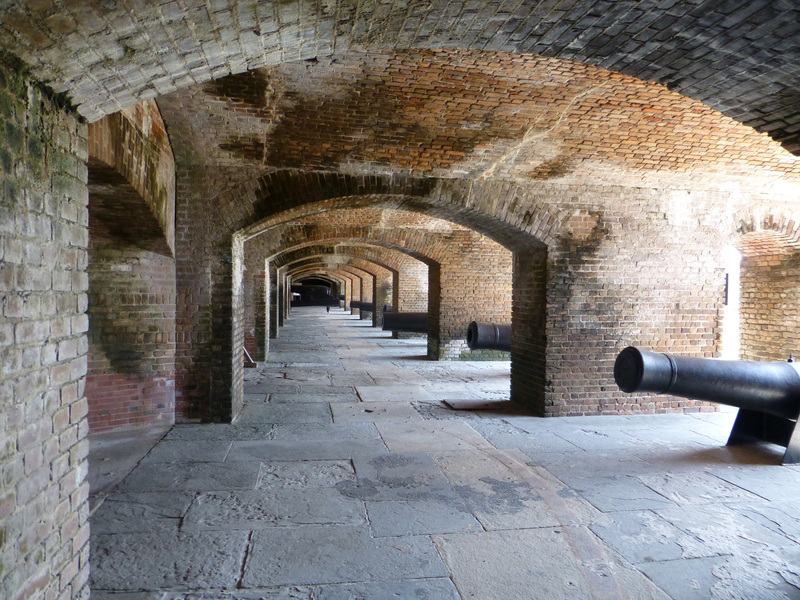 We told them that we would probably run into them at some point at Fort Zachary. We walked down Duval into the Kai-Kai Sandals store. As soon as we walked in the store, the salesperson was right on us. He was a character and a good salesperson because we each walked out with a new pair of the most comfortable flip flops we have ever owned. 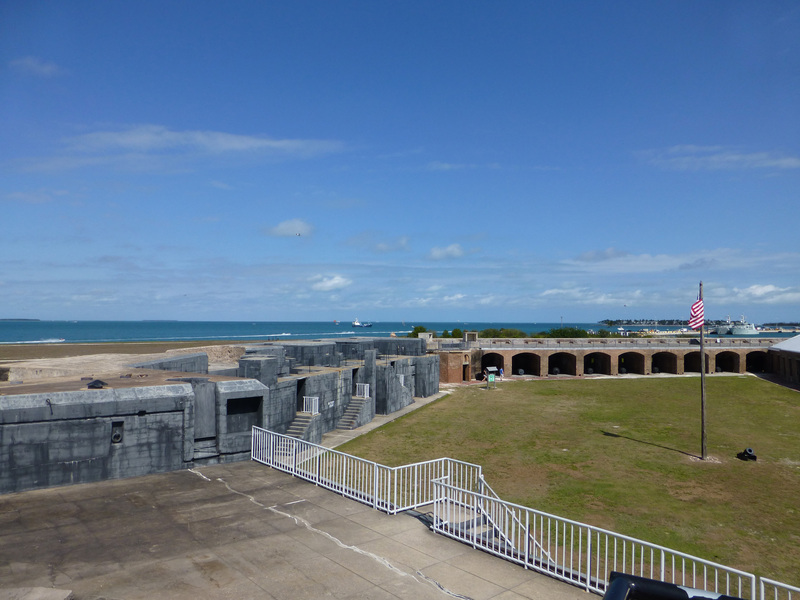 We dropped our bags off in our room at the Gardens and headed back out to Fort Zachary. The sun was out in full force that day and it was getting hot. We passed by a bicycle place but I insisted that it wasn’t that far and we can walk to the fort. 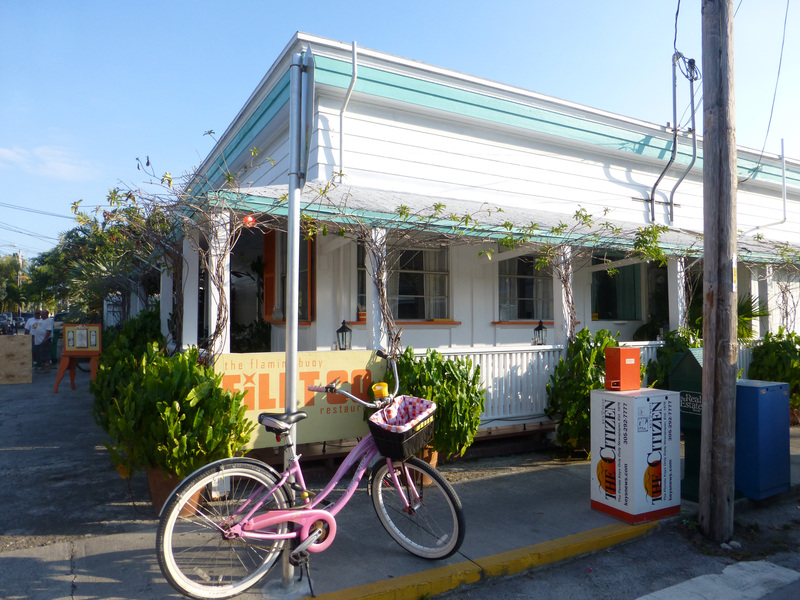 The best part of the walk was walking through Truman Annex area of Key West. It was so beautiful that I could imagine having a house here. Unfortunately we don’t have several million $$$$ lying around where we could, but it was really gorgeous – a girl can dream right? The fort was larger then I thought it was going to be and we were quite impressed. While we were walking around the fort we noticed two familiar faces – Johnnie and Chip! 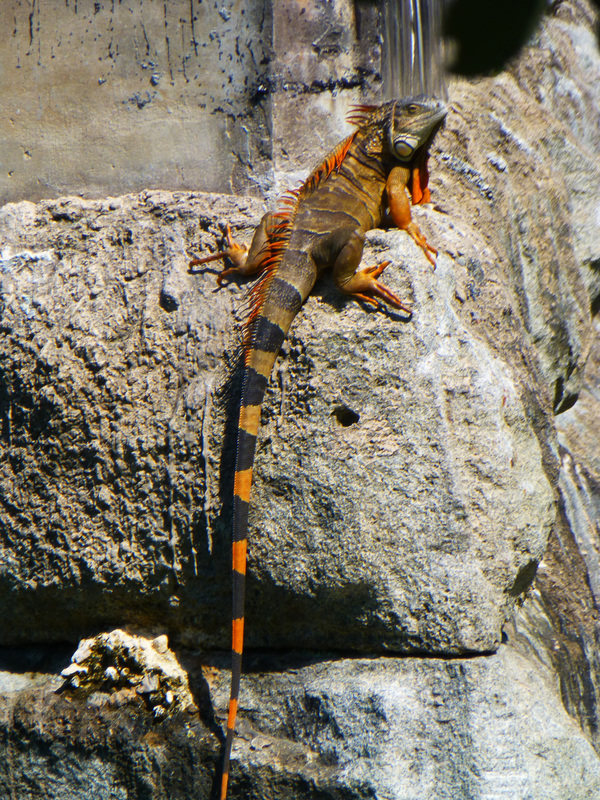 They were almost done with walking around the fort so they headed out to the beach. 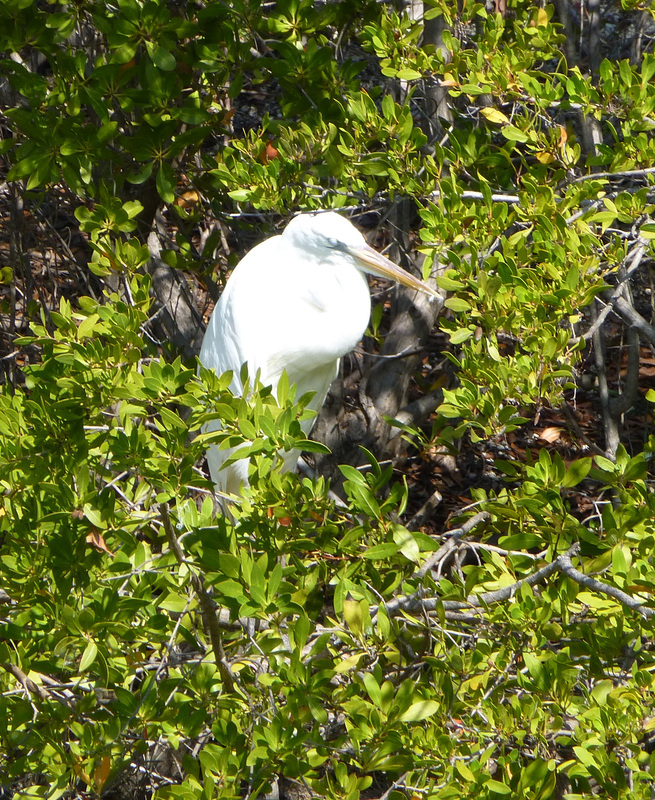 We saw some wildlife too around the area. We were curious about doing one of their tours, but the tour didn’t start for another 45 min. After we explored the area, we walked to the beach area. 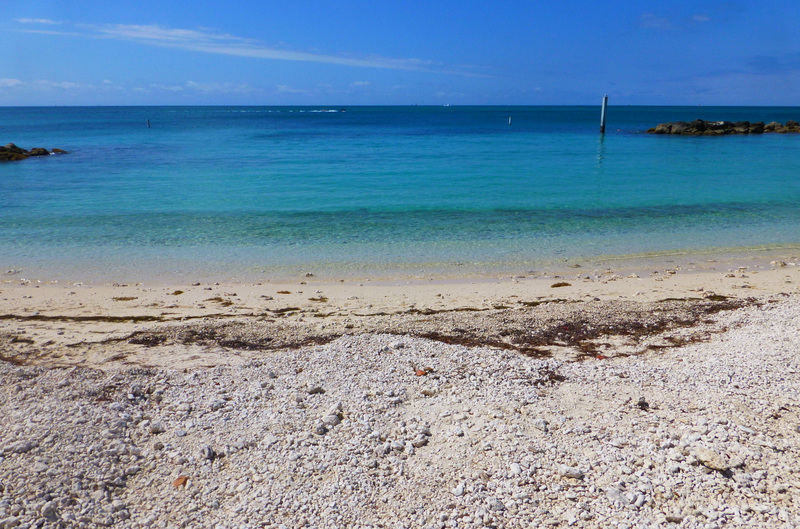 The water looked beautiful, but the beach itself was filled with pieces of coral and sand. It didn’t look as nice as the typical beach we are used to in the Virgin Islands, so we took a few photos and walked back to the snack bar where we grabbed a couple of cold beers to quench our thirsts. (If you do go to the snack bar to have a beer, you have to drink the beer there and cannot bring it to the beach, most likely because of the glass bottles.) Once we finished our beers we made the journey back towards Duval.Thankfully the walk back didn’t seem anywhere near as long as the way there. We walked passed the Green Parrot and gift shop so I went in to grab a shirt. 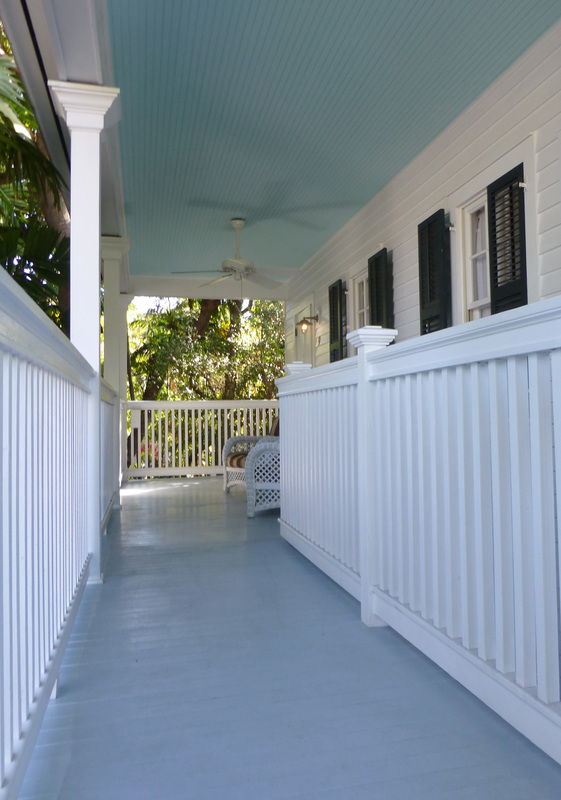 Then our next stop was the Porch. My husband and I recently have gotten into craft beers and wanted to check out their selection. We walked up the stairs into the “house” where we found a small bar inside. There we ordered two beers and took them outside on the porch. 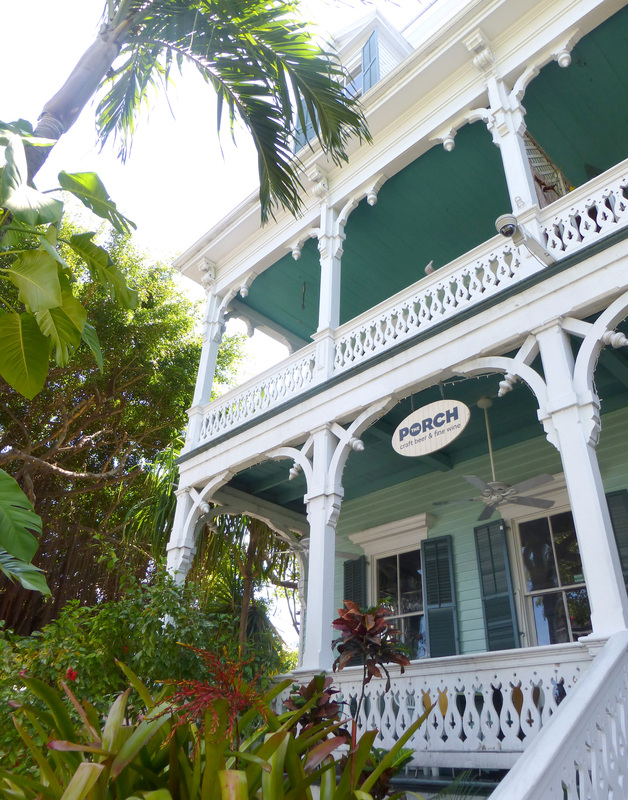 http://www.theporchkw.com/ It was a beautiful place to sit down and watch all the people and conch trains go by. We were sitting in the shade for a while and I wanted to go back in the sun. We finished our beers and walked down Duval back to the Sunset Pier. 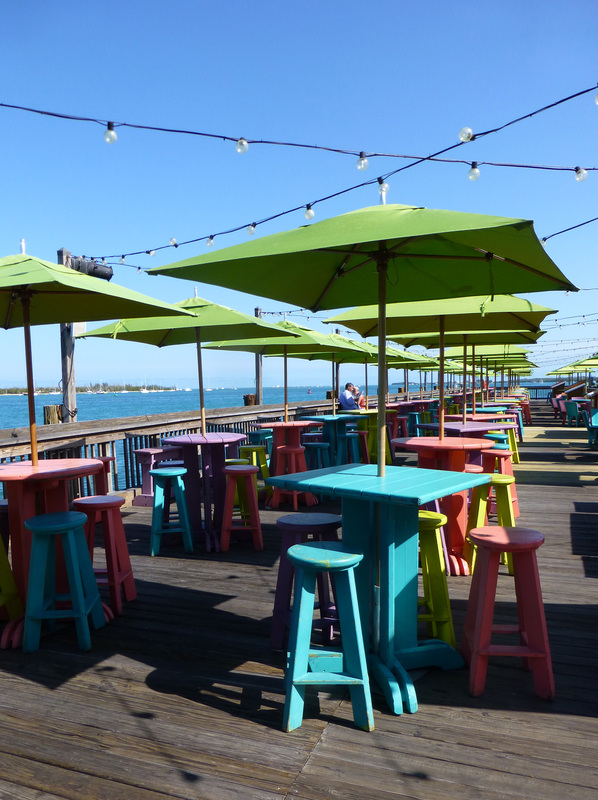 The Sunset Pier is one of my favorite places to grab a drink while taking in the sun. We walked down the pier and grabbed a seat in the sun. We enjoyed a few drinks and listening to some good music. My husband checked his phone and got a message from Johnnie and Chip that they were at Rick’s. We finished our drinks and then walked to Rick’s to meet them. I asked them if they would be interested in going on the Schooner American on Saturday for a day sail and everyone was in. I gave them a call the sail was booked for Friday. 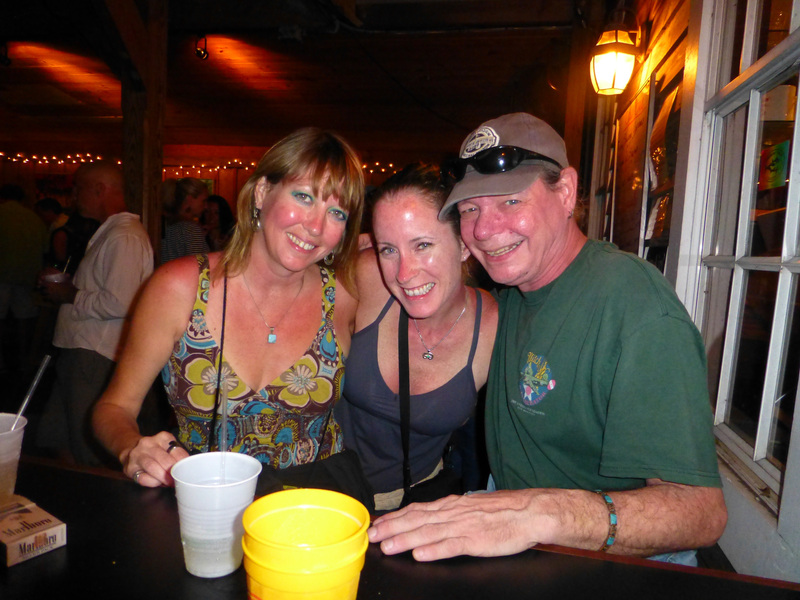 Our friend Will was playing later that evening at the White Tarpon and we hadn’t seen him or his wife Lynda since the Galleon the first night. 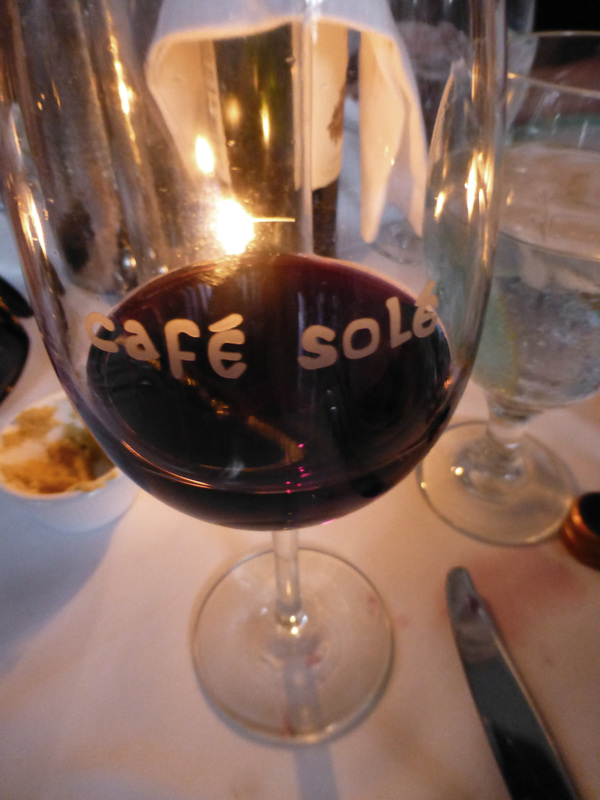 I had made a dinner reservation for the four of us at Café Sole, but we had time to meet up with them at the White Tarpon before dinner. 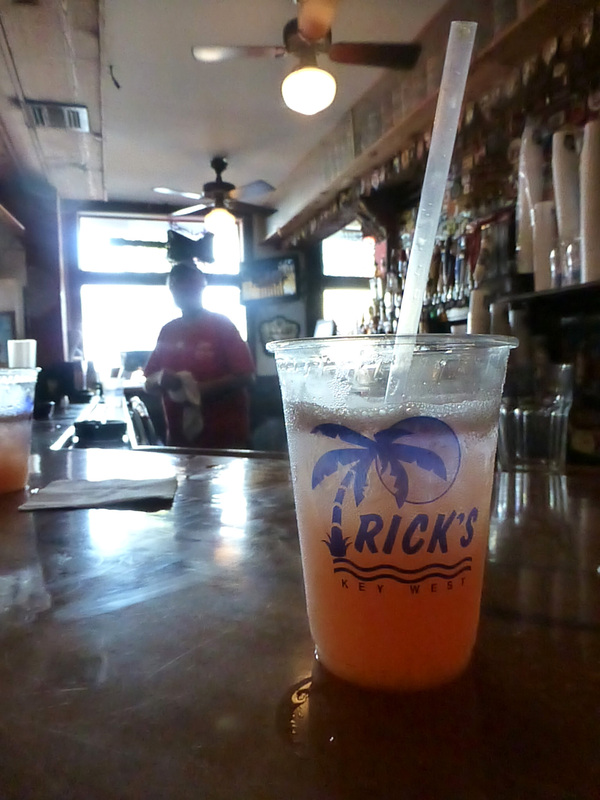 We finished our drinks at Rick’s and made our way back to get ready for dinner. 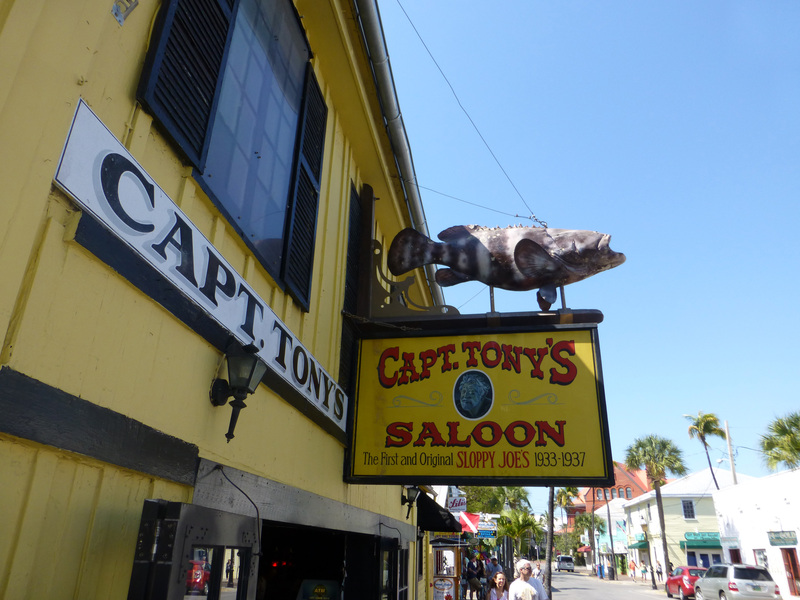 Since Duval was getting more crowded as the week went on, we decided to walk down Simonton St. to get to the White Tarpon. 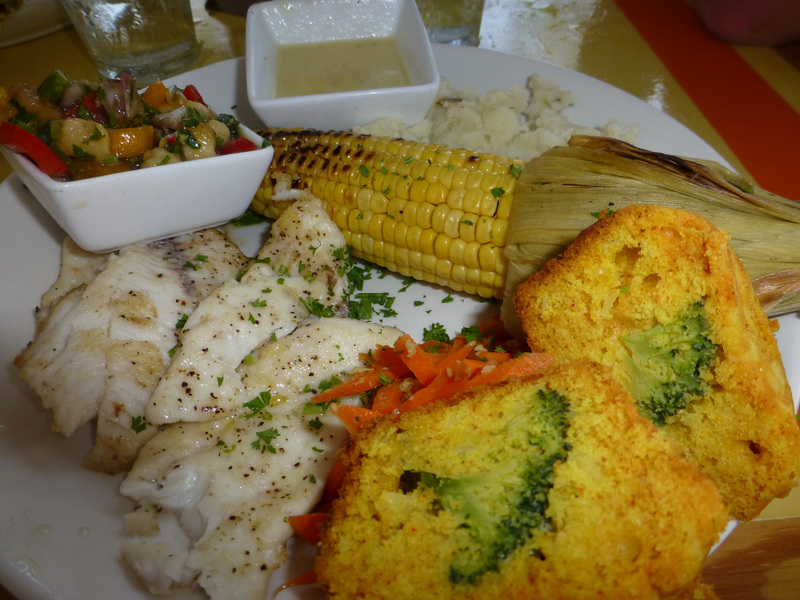 Simonton is a nice alternative to Duval if you want to avoid the crowds on the street. 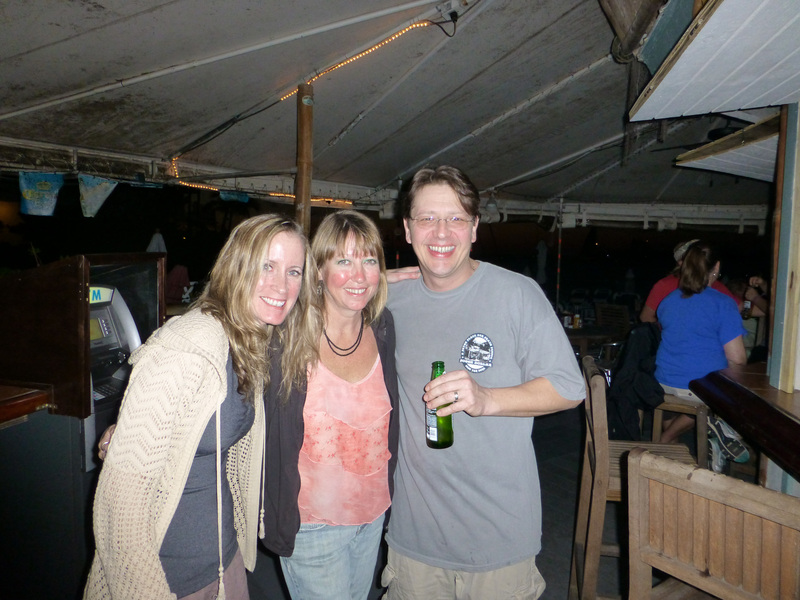 We made it to the White Tarpon as we walked in, we could her Will’s voice singing away. For the first course, I had the escargot while my husband had the beef carpaccio. 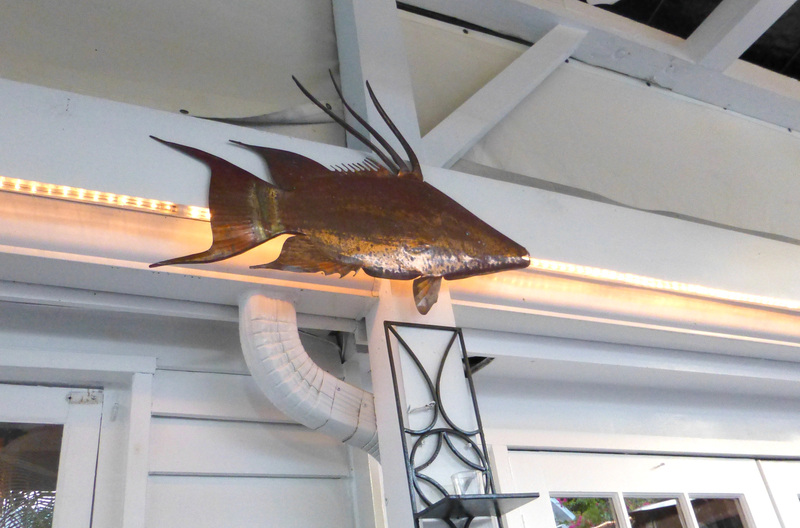 For dinner, everyone but Johnnie ordered the hogfish for dinner. It was amazing like I always remember. Its a shame this fish isn’t available in more places, but it never disappoints. The flavor cannot be beat. We also got a kick out of the service. 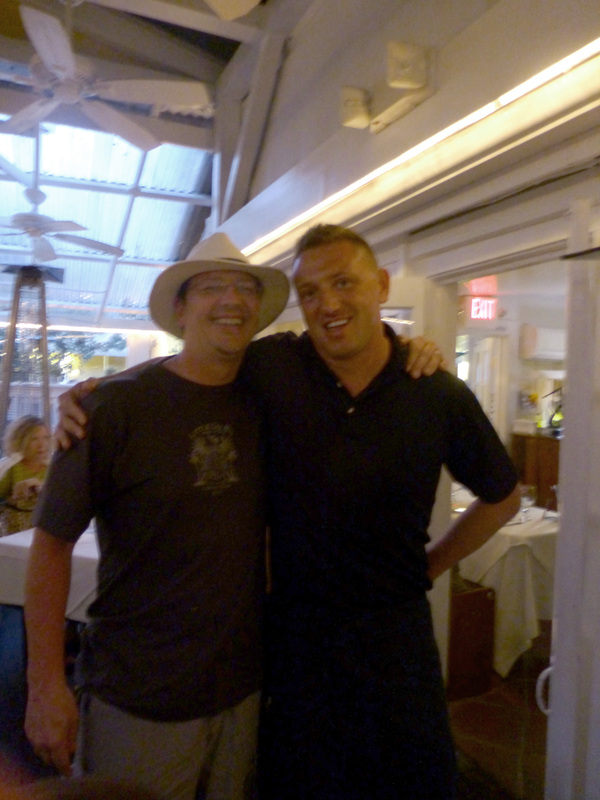 Our waiter was right off the boat from Poland and my husband speaks a little bit of polish. Lets just say they had some conversations going back and forth that no one else knew what they were saying! When dinner was over, we went our separate ways. We were scheduled to meet Billy at 9:30 the next morning at the Gardens so we didn’t want to be up too late. 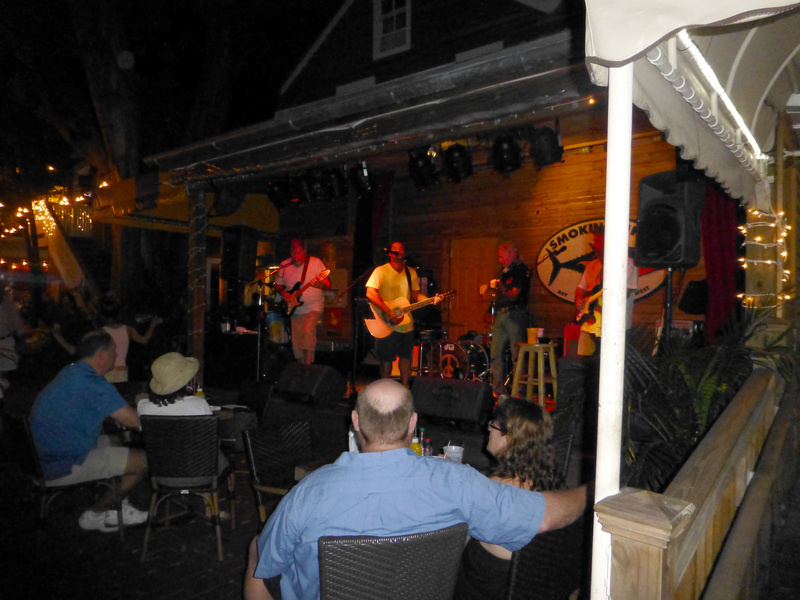 It was around 9 o’clock when we were finished with dinner, and Will was still playing at the White Tarpon. 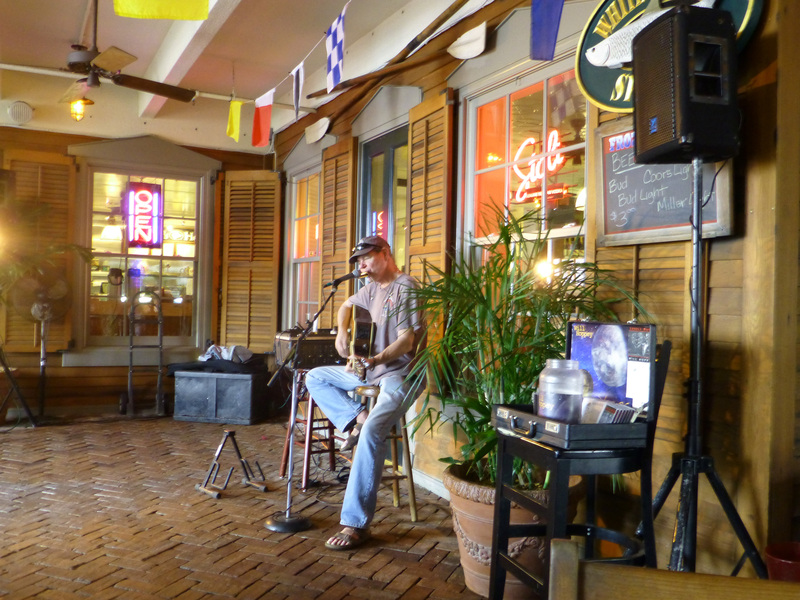 We walked back to the White Tarpon to catch a few more of his songs before he was done for the evening. We said good night to Will and Lynda and told them we would try and get together the following night after the fishing trip. It was getting late and we knew we would be in trouble if we didn’t head back to the hotel to get some sleep. We finished our beers and called it a night. We woke up to a bright and sunny day, perfect to go out on the water. Since Billy was picking us up at the Gardens that morning, we didn’t want to walk too far for breakfast. 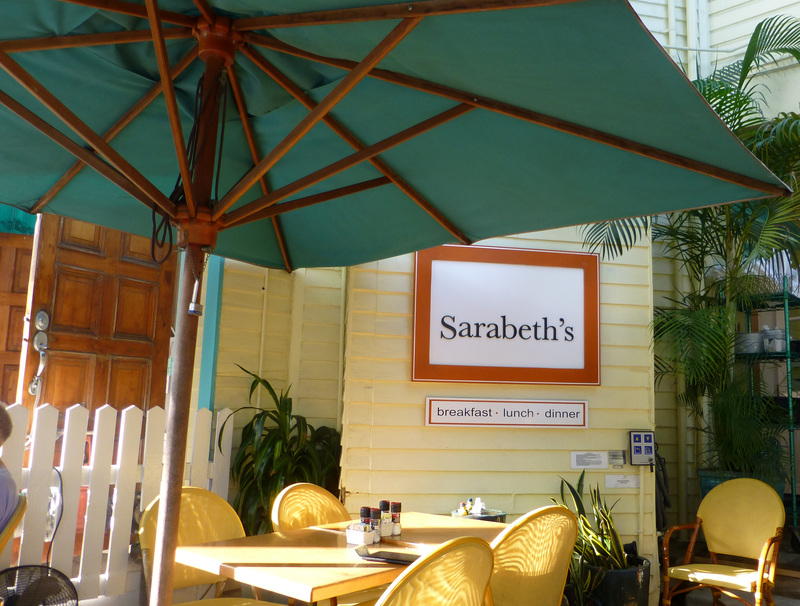 We all met up at Sarabeth’s for some breakfast. 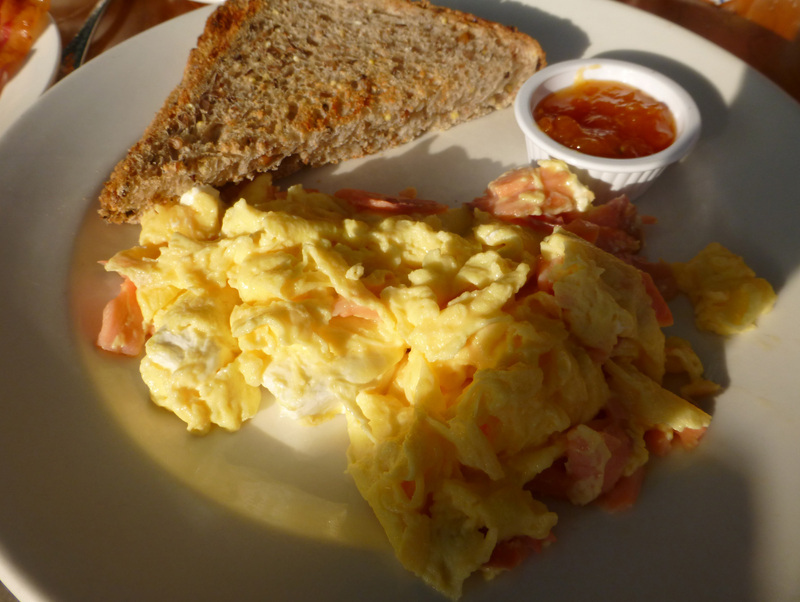 I enjoyed their signature scramble with smoked salmon, where as my husband enjoyed their “Fat and Fluffy” french toast. After another satisfying breakfast, we all walked back to the Gardens to wait for Billy. He gave us a call when he was on our way. 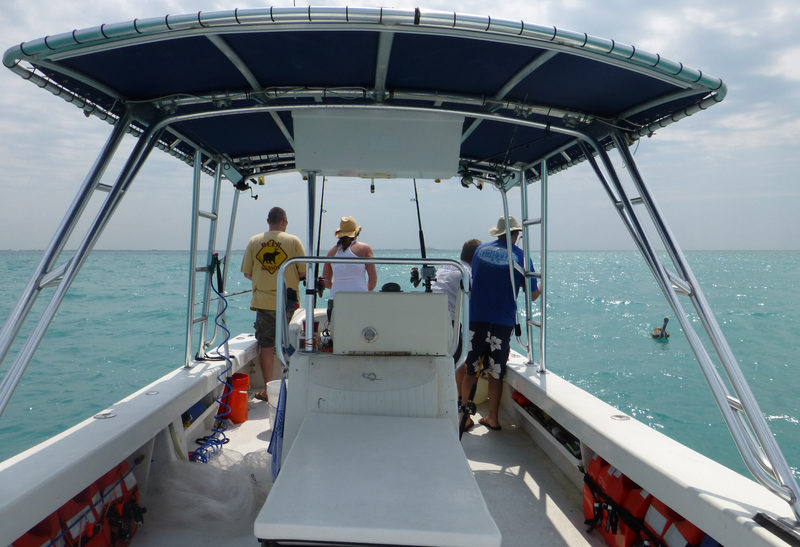 We piled into his pick up truck and headed to the dock to begin our day out on the water. I mentioned to Billy that I didn’t want to go out as far as the previous year, even though it was a great day out. We decided to go to a closer spot to do some fishing that about 30 minutes away. The spot proved to be a good one as everyone caught something. 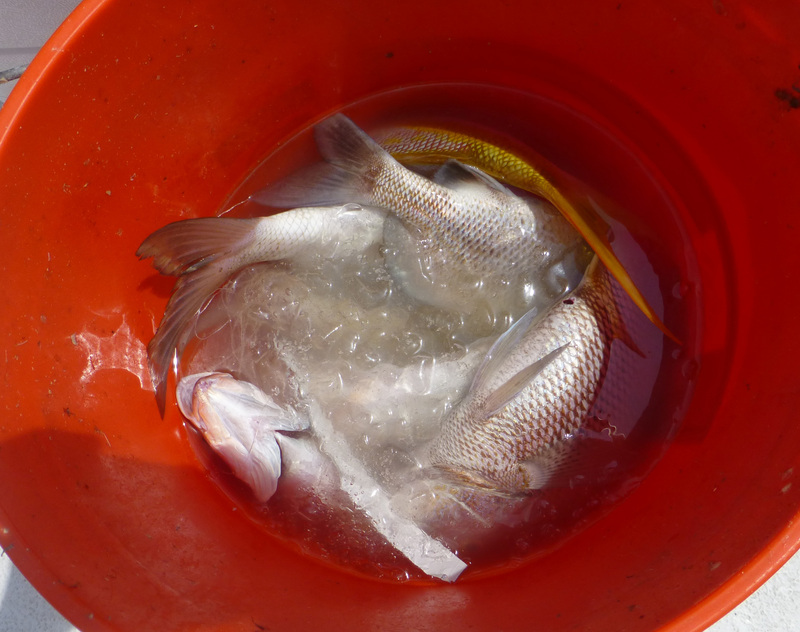 Yellowtail snapper and porgy were the two types of fish that were caught. I was feeling a bit of the night before so I decided to sit back and watch the action. A few hours passed and I was feeling better. 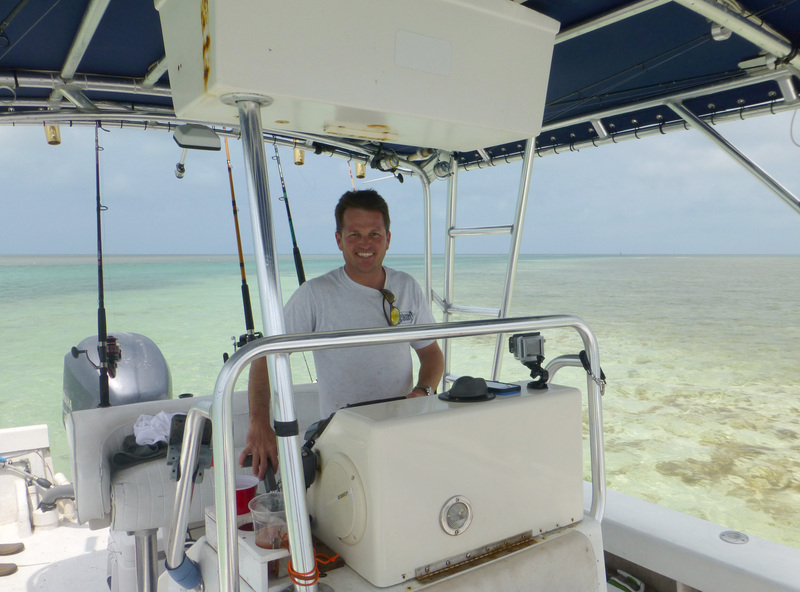 Everyone had their fill of fishing, so Billy took us to a sand bar. 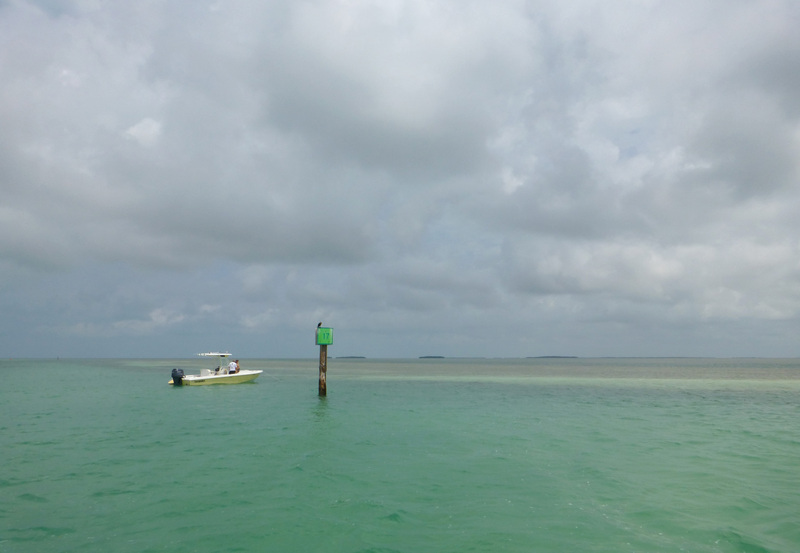 It was high tide when we got to the sand bar, so it was completely covered with water. We were still able to get out walk around. 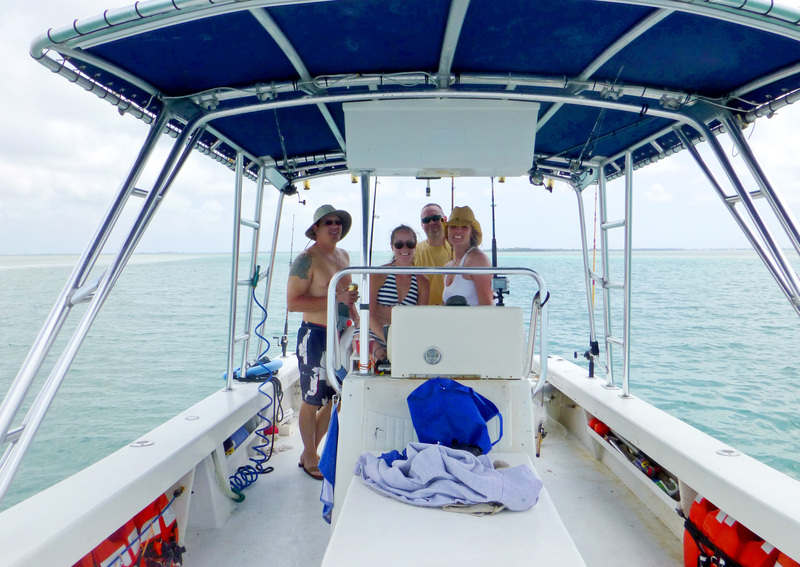 Then we all got back into the boat and cruised around the water. 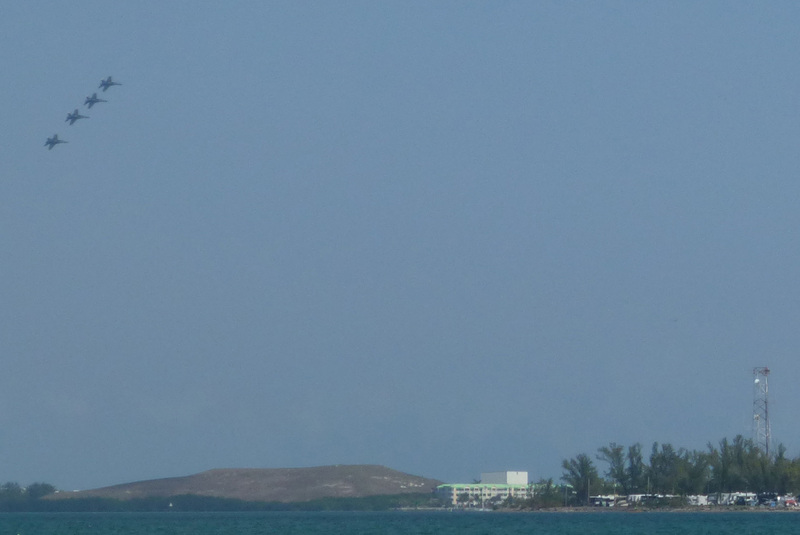 From a far, we could see the Blue Angels from the air show that was going on in nearby Boca Chica Field. It was nice to relax and have a few beers on the water. It was a great day to be out on the water. When we got back to the dock, Billy took our catch and cleaned the fish for us. 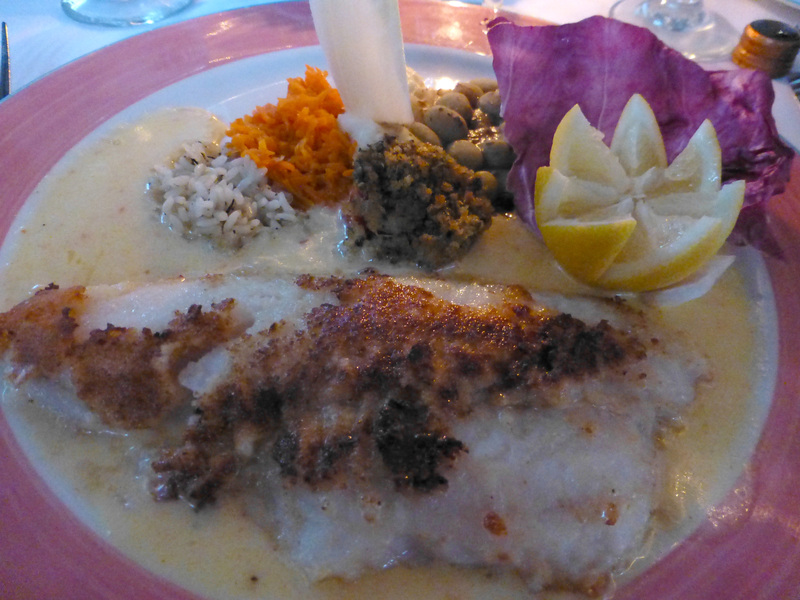 He even dropped off at a nearby restaurant so that we would have “our catch of the day” for dinner. He recommended the Flaming Buoy for dinner and we told him we could be there around 6:30, so we were all set. We all departed to our accommodations to get ready for dinner. The Flaming Buoy is located near the Chelsea House where Johnnie and Chip were staying so we would meet them at their place. We were already for dinner and headed back out towards the Chelsea House. 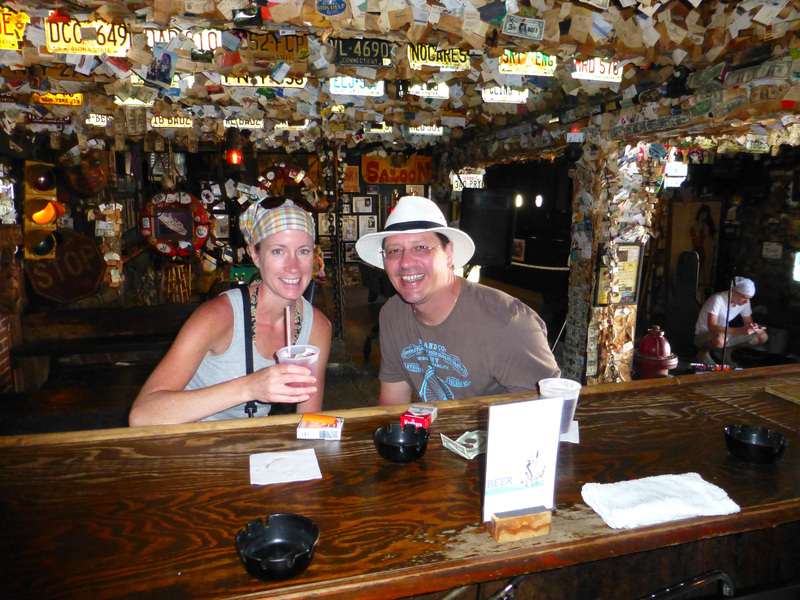 We got a message from Johnnie and Chip that they were having a drink at a place called Duffy’s. We wound up meeting them there for a drink before walking to the Chelsea House. They showed us their place and thought it was very charming. 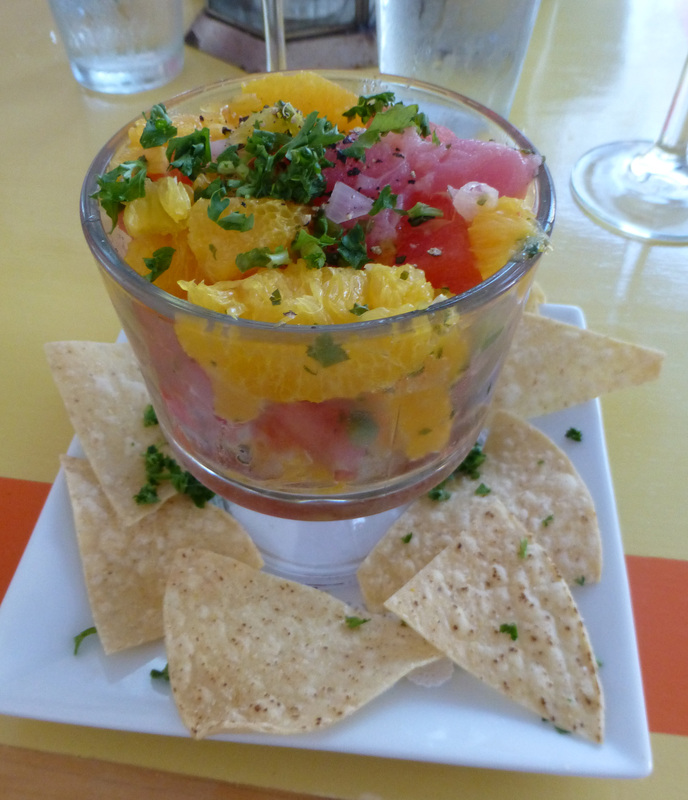 I started with the tuna ceviche, while my husband had the lobster mac and cheese. For dinner everyone had the catch of the day with their side dishes of the day. 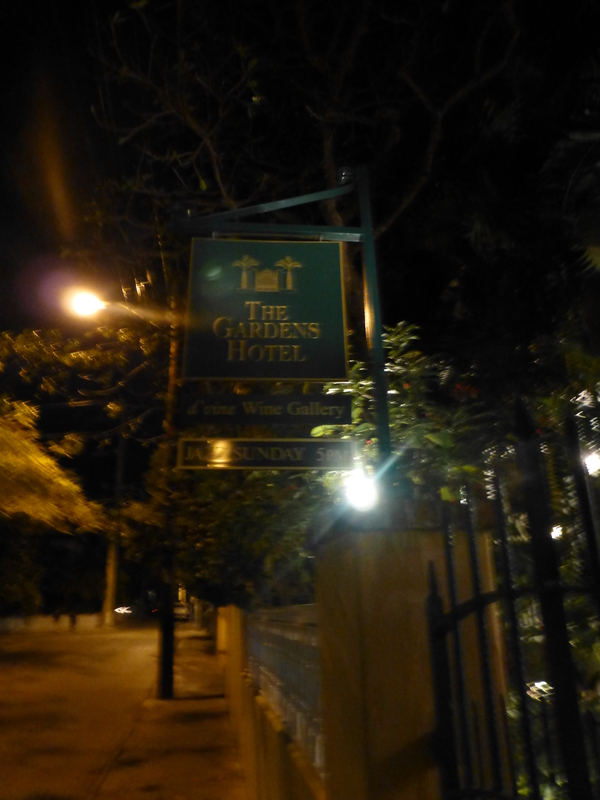 After a wonderful dinner we agreed to walk back to the Gardens Hotel first for a glass of wine before going out to the Smokin’ Tuna. 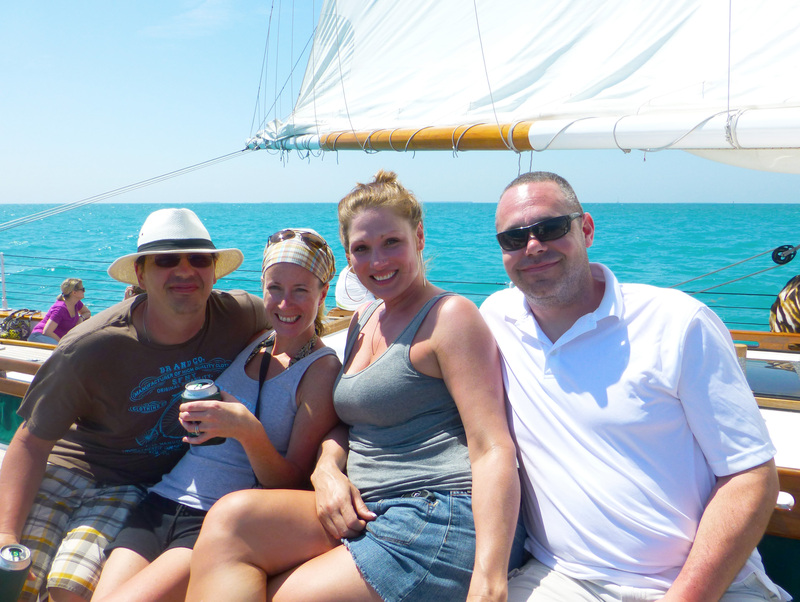 Once we all had our glasses of wine, we realized that we were all pretty tired after being out on the water all day. I had already gotten in touch with Will and Lynda and they were on their way to the Smokin’ Tuna. I convinced my husband to go, while Johnnie and Chip headed back to the Chelsea House. We told them good night and we would meet them again at Blue Heaven for breakfast. Once we started walking again towards the Smokin’ Tuna I did get a second wind (sort of). We walked in and saw Will and Lynda at the bar. The place was jammed packed with people. We ordered a couple of margaritas and listened to Caffeine Carl play. It was a great time, but I was getting tired. It was another long day. After the second set we left and headed back to the Gardens for the night. We woke again a bit later then we wanted to. We gave Johnnie and Chip a call before heading down to Blue Heaven. When we first left our room, we noticed that it was probably the hottest its been during our stay. Chip and Johnnie were waiting for us at the bar when we walked in to Blue Heaven. We made it just in time to grab one of the last remaining tables of 4. We all once again enjoyed a great breakfast. 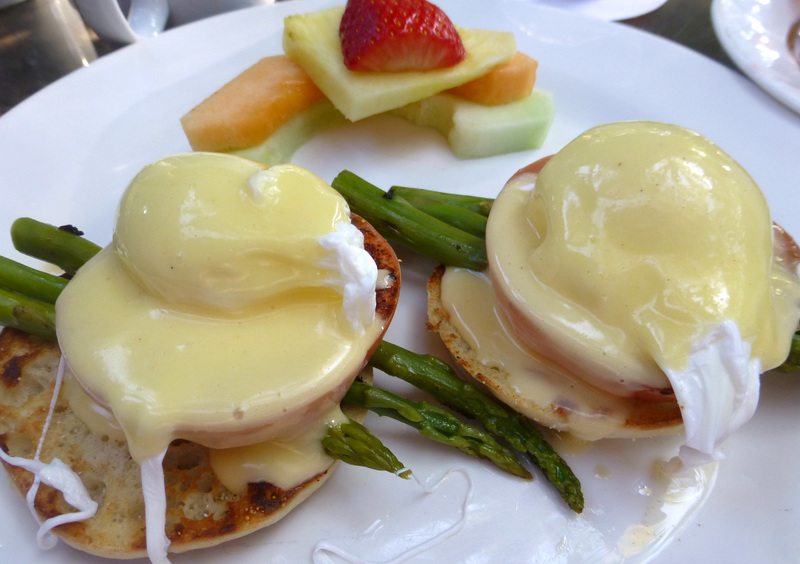 This time I tried their veggie eggs benedict which was very good. When we finished our breakfast we realized it was our last full day and wanted to get some shopping done. 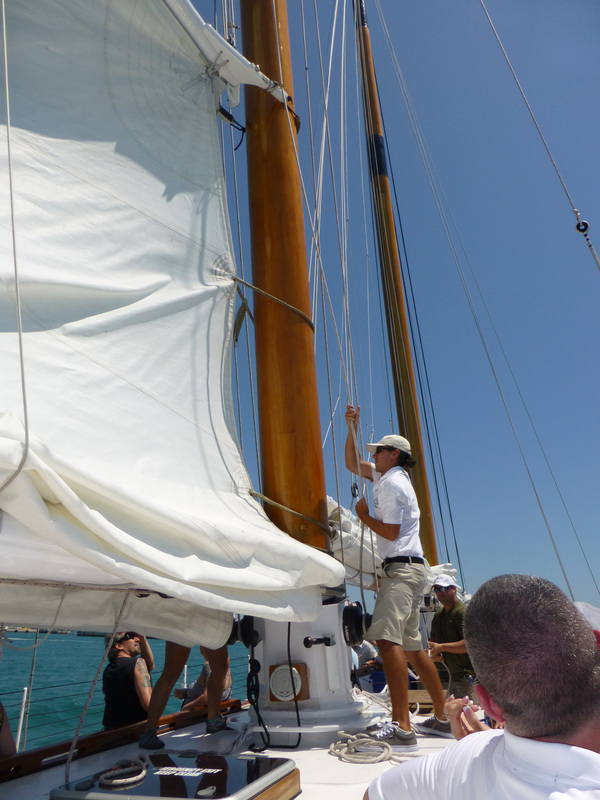 Our day sail was set at 1:30 on the Schooner America 2.0 and had to check in around 15 min. before. We decided to split up and get our shopping done and meet up in a few hours. We walked around looking at different shops for some souvenirs. I began to notice that many shops have the same things in each one, as far as t-shirts, etc. We made our way town to Peppers. My husband tried a few hot sauces, but I decided to sit it out. We purchased a few hot sauces and headed back to the Gardens to drop off our bags. We walked back onto Simonton to go to Captain Tony’s. I usually forget my business card to hang up at Captain Tony’s, but this year we each had our own and were determined to get back there. As we walked towards Captain Tony’s, we noticed how quiet the streets were. We were told a lot of people were at the air show. We walked into Captain Tony’s and were the only patrons at the bar. 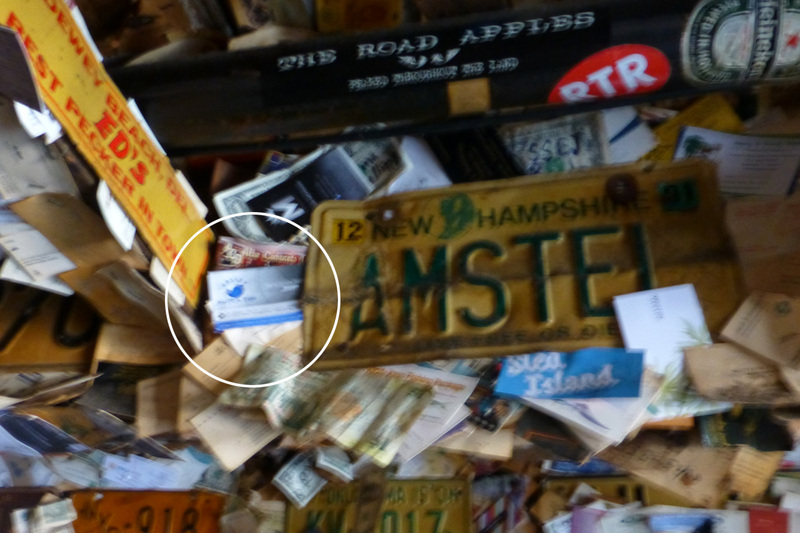 We ordered something to drink and left our business cards behind – mission accomplished. We checked in about 15 min. before the sail and grabbed our boarding passes. We all boarded the boat and found a perfect spot to sit. The boat was barely half full when we took sail – which was great. Beer and wine were offered for a $1 a piece, while soda was included. We all had a beer and watched as they raised the sails. 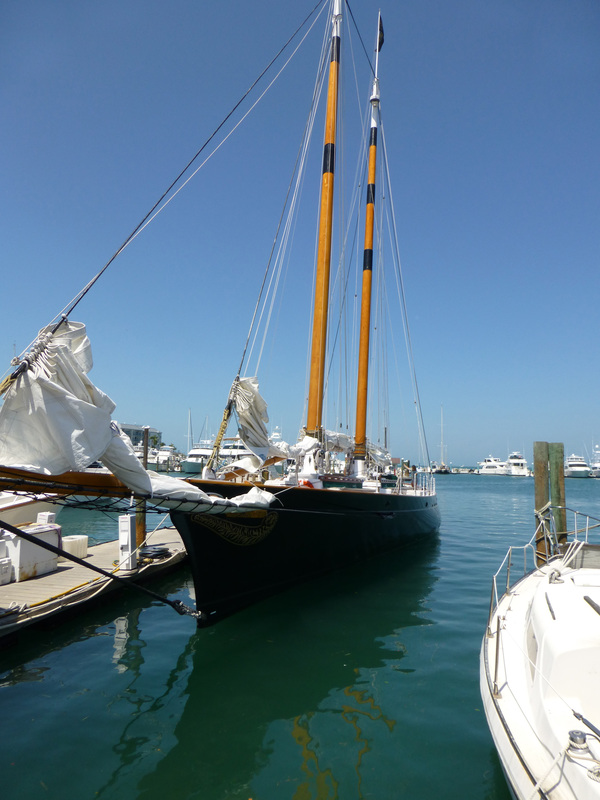 The Schooner America 2.0 is a beautiful boat – I even got to steer her. I highly recommend going out on a day sail or even a sunset sail on this schooner. The sail lasted about an hour and a half and we were all feeling pretty good. Our friend Will was playing at Rick’s that afternoon, so when we got back to the dock, we walked back to Rick’s to meet up with Will and Lynda. We grabbed a few seats and listened to Will as he finished up for the day. I had made reservations for all of us that evening at Michael’s for our last dinner. So when Will was done playing, we headed back to the Gardens to freshen up for dinner. On our way back I remembered that I wanted to stop at the Margaritaville store for a few girls for some friends. When we walked in we noticed that the display of pet photos was gone. We asked about the display and the employee told us that they no longer have it, but a fellow employee scanned in all the photos of pets wearing a Margaritaville collar into a slide show that was looping on a tv screen above our heads. 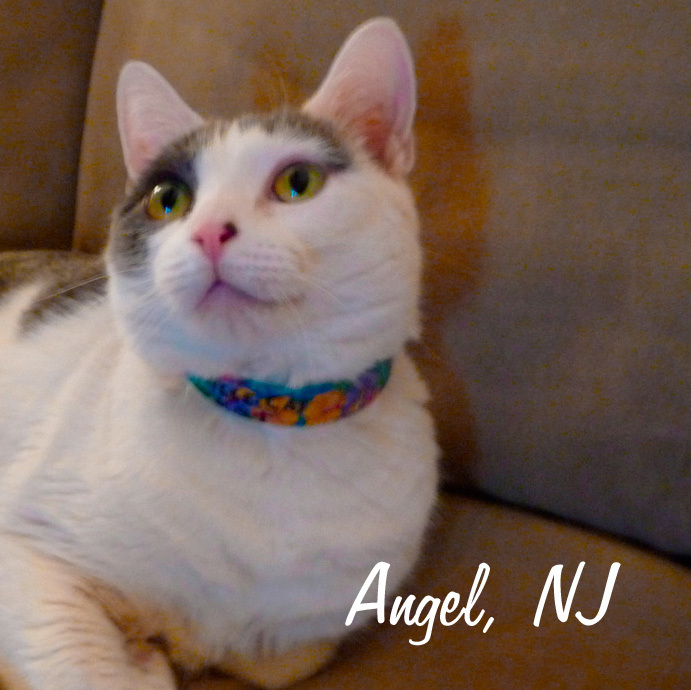 (As a side note, a few years back I took several pictures of our cat wearing a Margaritaville collar and sent it to them but never knew if they got the photos or not.) As I was paying for my order of Margaritaville apparel, my husband was watching the looping tv screen of all the pets. Within a few minutes as we both looked up we saw a picture of our cat. She made the cut! 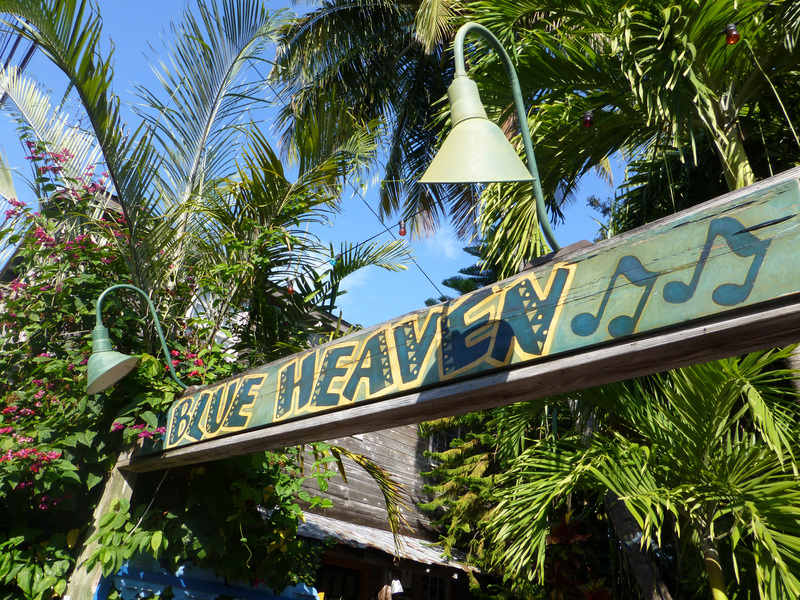 We got a big kick out of it knowing our cat is now being shown in Margaritaville everyday in Key West. We made it back to the Gardens to get ready for dinner. When we walked in we noticed that there were a lot of people gathering around the pool area. The Garden’s hotel was an event for the evening which we didn’t mind since cocktails were free for guests of the hotel. Will and Lynda met us at the Gardens and when we walked to Michael’s. 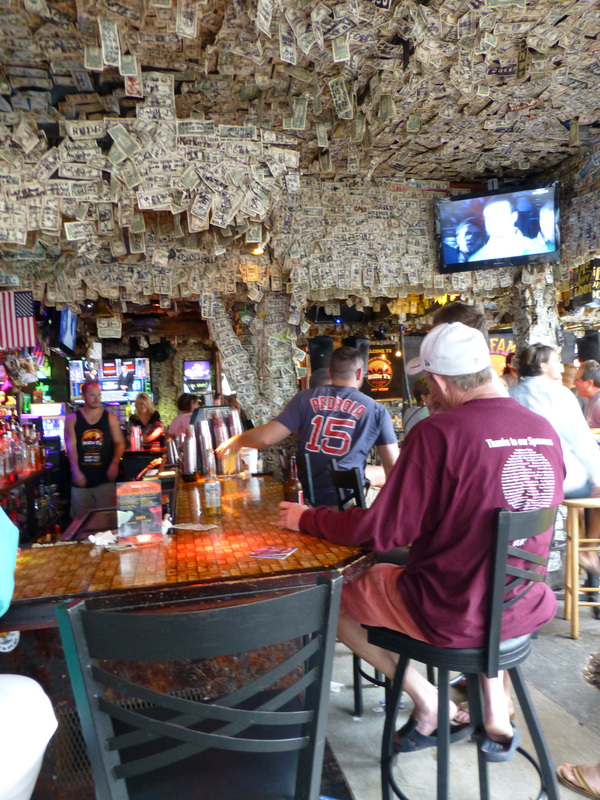 Being we were with Key West regulars, we didn’t have any trouble finding the place. 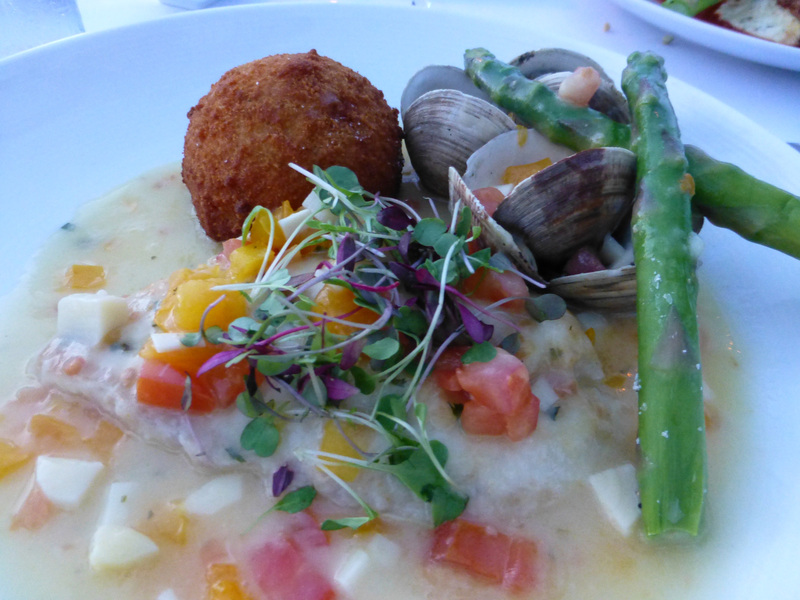 For an appetizer I had the oysters rockefeller – and didn’t take a picture because I ate them to fast! 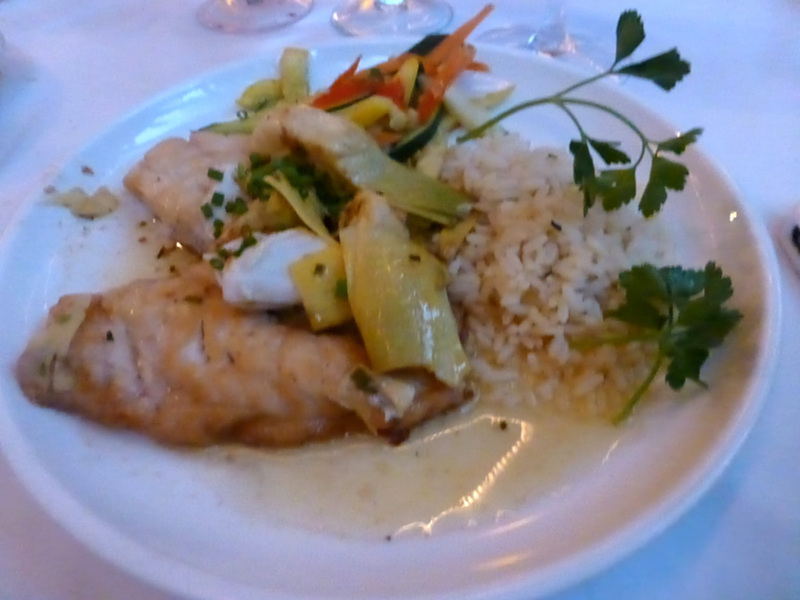 For dinner I had the pan seared snapper which was very good. It was a great place to spend dinner together for our last night, even though its a bit blurry! 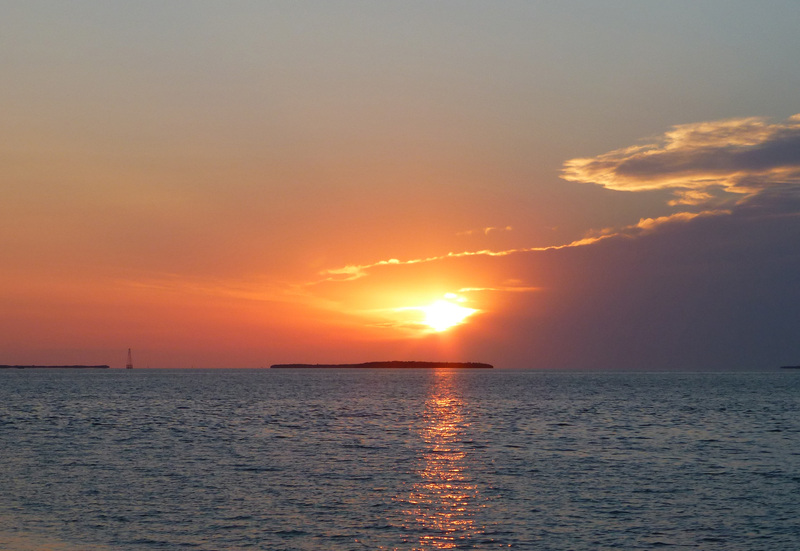 We had to be up early the next morning for our 7am flight out of Key West so we said our good byes. We told them we would see them when they come back to NJ/NY area this summer. We woke up around 5:00am to catch the 5:30 taxi the Gardens had called for us. It was pitch black out and again very warm. The streets were silent until we heard our taxi pull up to the hotel to take us to the airport. The flights were uneventful and before we could even realize, we were already back home in NJ. Even though we have been to Key West for the past 8 years, we had a wonderful time experiencing places both old and new with our friends. We hope to be lucky enough to return again next year. I guess you can say we have a case of the “keys disease”. 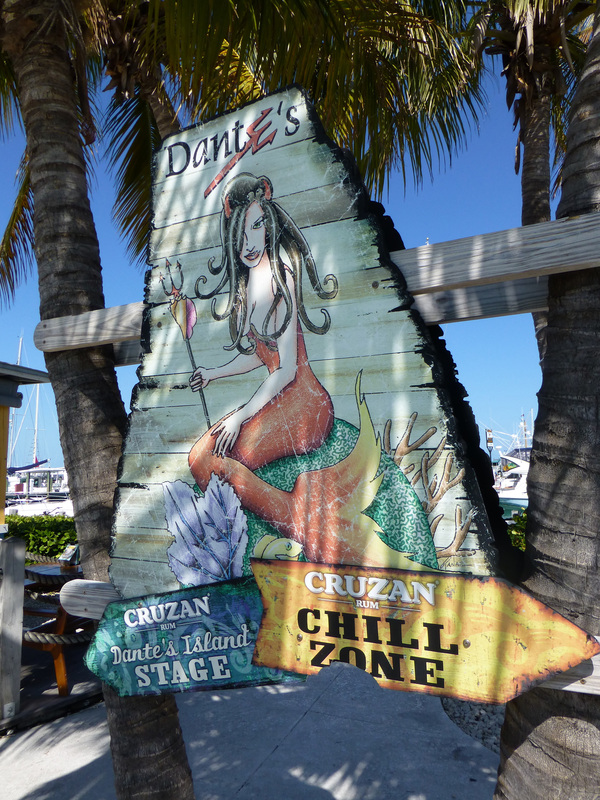 Thank you for taking the time reading my experience in Key West. 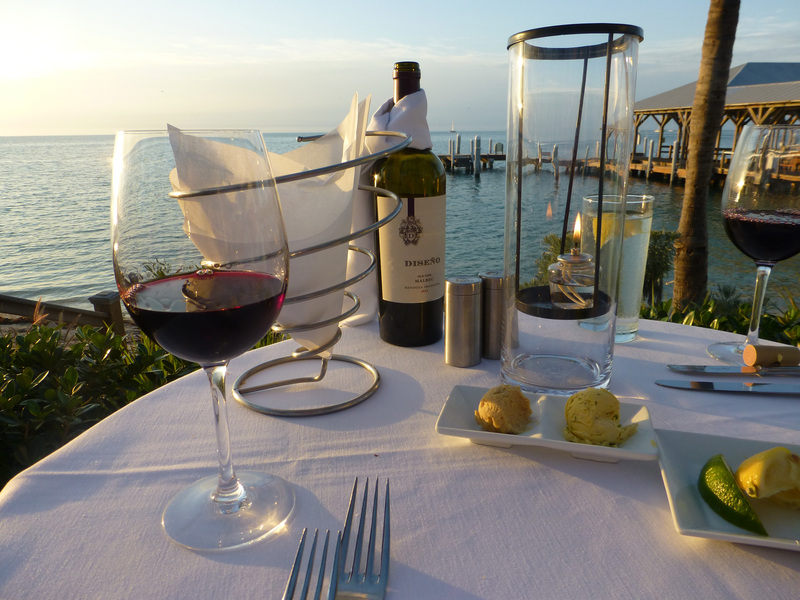 Until next time remember to eat, drink, travel and be merry…. Great photos and fun trip report. 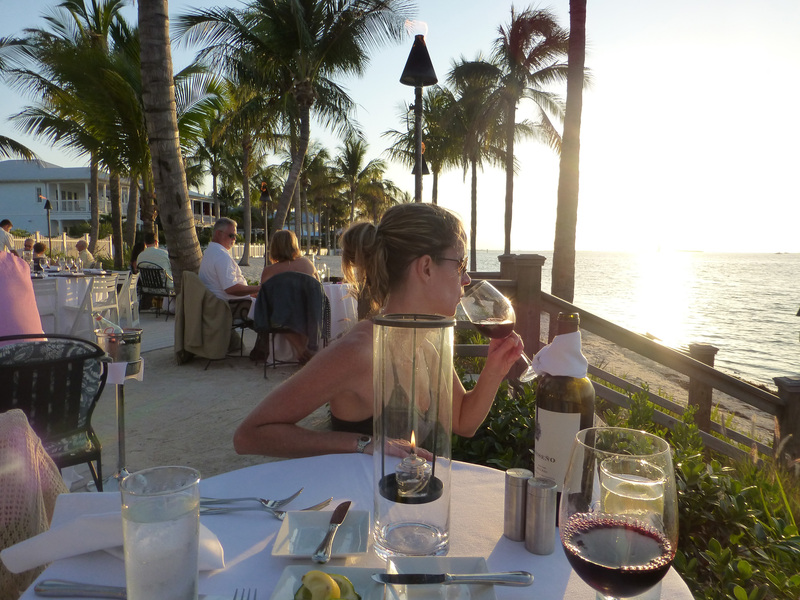 I also love Key West, so very much. Can’t wait to get back there, but unfortunately probably won’t be until next spring. Awesome trip report! I am going to read this again and again. We’ll heading back in december (2 mos) and this is really getting my key west adrenaline going! Thanks for these wonderful !!!!! !pics again. 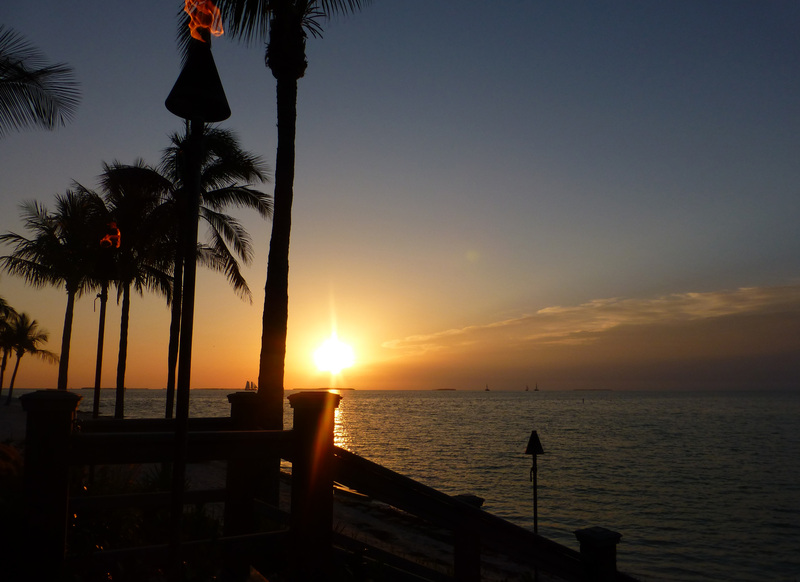 We will be next week in Miami and drive for one day to the keys….Looking forward…!!!!!! Hello my good friend sue! Just checking out all your beautiful pics. 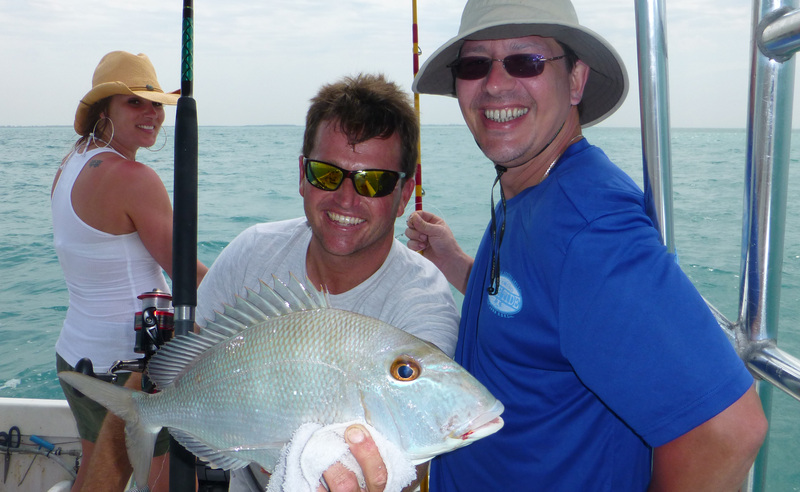 Don’t want to rush the summer but looking forwards to our key west trip with you guys next year. I know for sure we will have an awesome time as we always do! This is fantastic!! 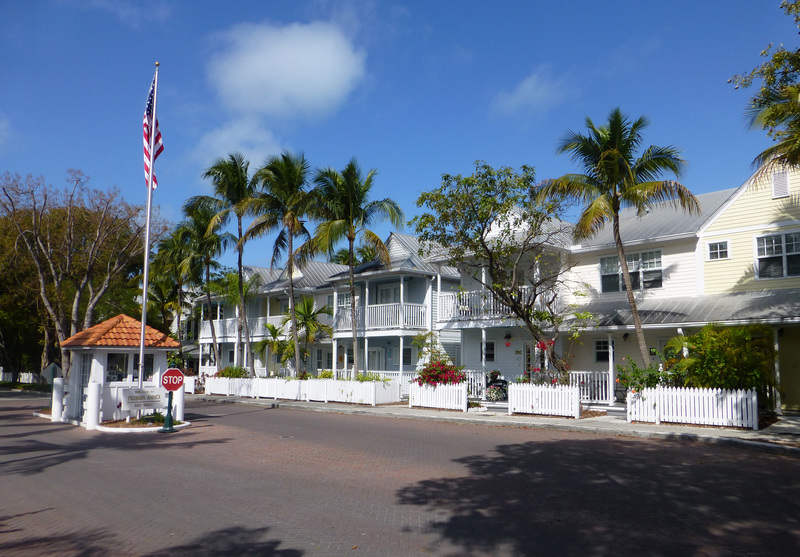 I’ve spent many many hours trying to research where to stay in key west. We are four adults travelling August 2. For 6 nights. We will be flying from Canada and then driving from Ft Lauderdale. 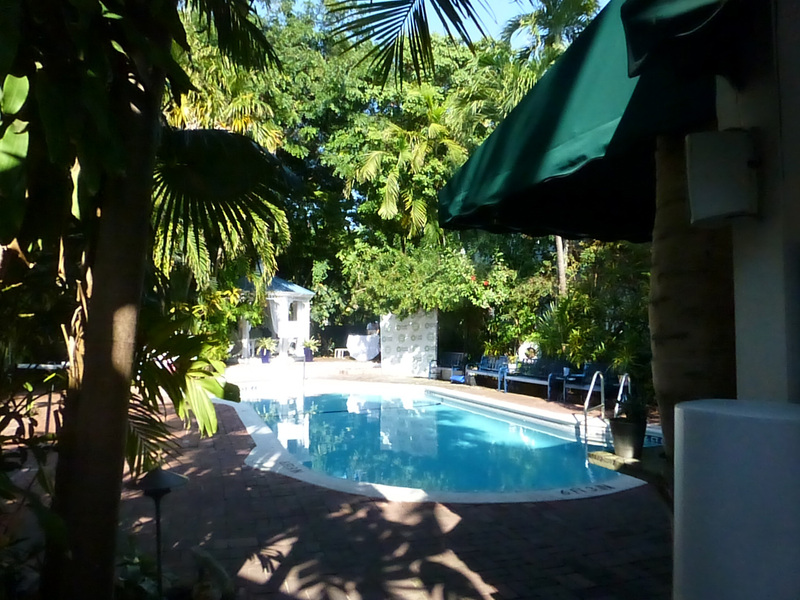 We are looking for something authentic, with a pool, and within walking distance to most attractions etc. Any advice. I’m completely overwhelmed with the choices:) thank you! !